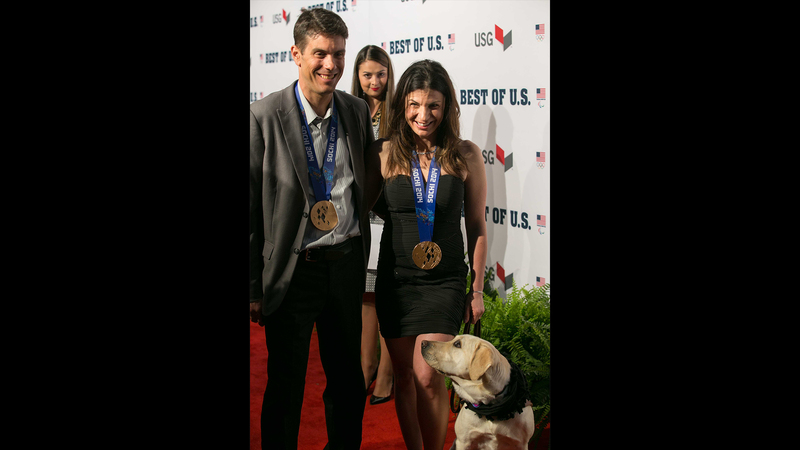 Outstanding Paralympians and Olympians from 2014 Winter Games in Sochi were honored last night at the inaugural "Best of U.S." Awards Show, held at the Warner Theatre in Washington, D.C. 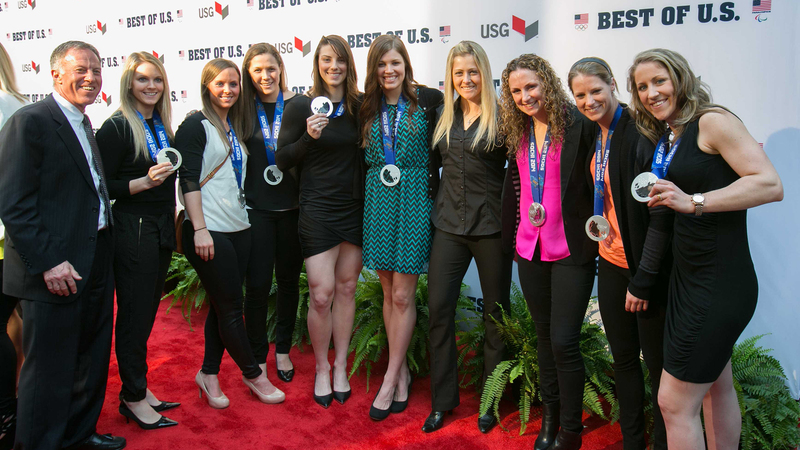 Presented by the United States Olympic Committee, the awards were decided by fan voting on the Team USA Facebook page. 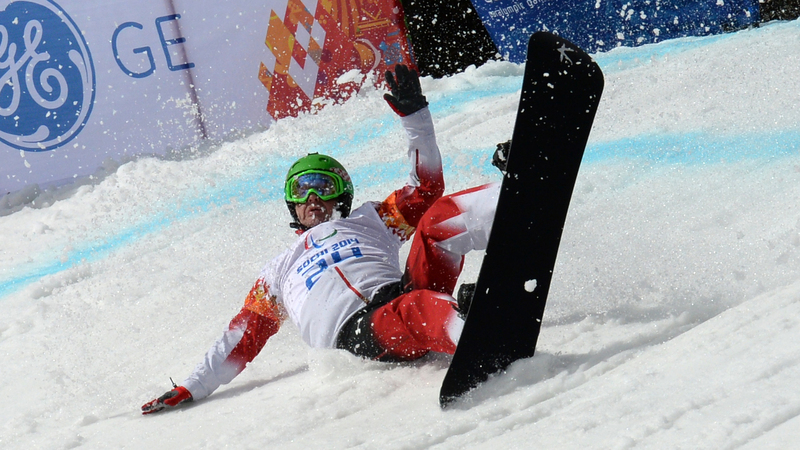 Skier Mark Bathum won as Best Male Paralympian for his silver medal performances in both men’s super-G and super combined events (visually impaired). 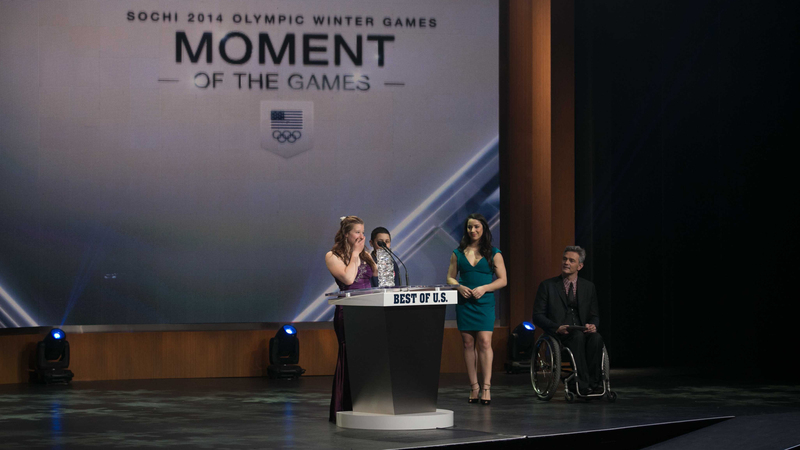 Eighteen-year-old skier and first-time Paralympian Stephanie Jallen took home two awards, for Best Female Paralympian and for Moment of the Games. 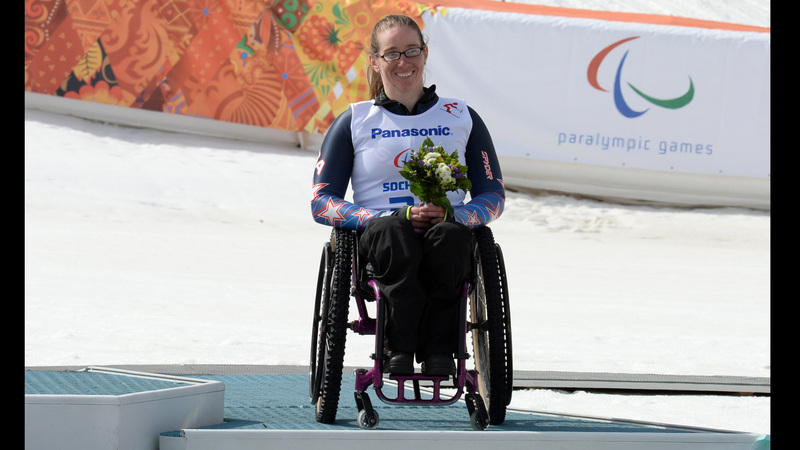 When Jallen won bronze medals in women’s super-G — her first Paralympic event ever — and in women’s super combined (standing), her joyous reaction lit up the medals ceremonies. 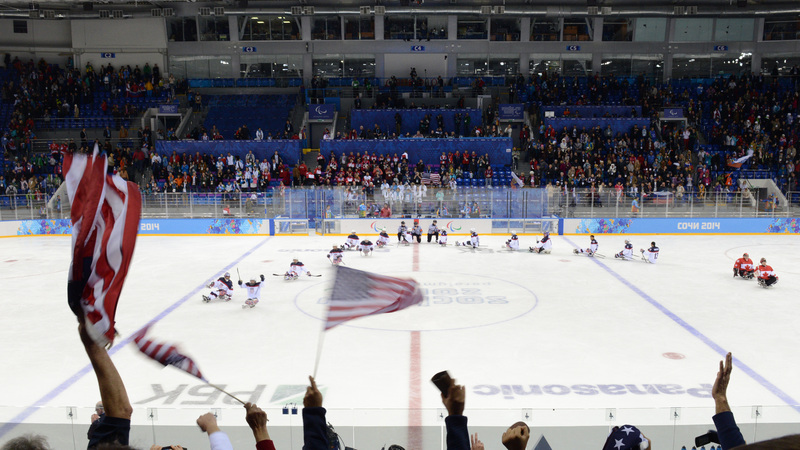 And our ICE WARRIORS were voted "Team of the Games" for winning historic back-to-back gold medals as they defeated the home team, Russia, in their home arena. 1. 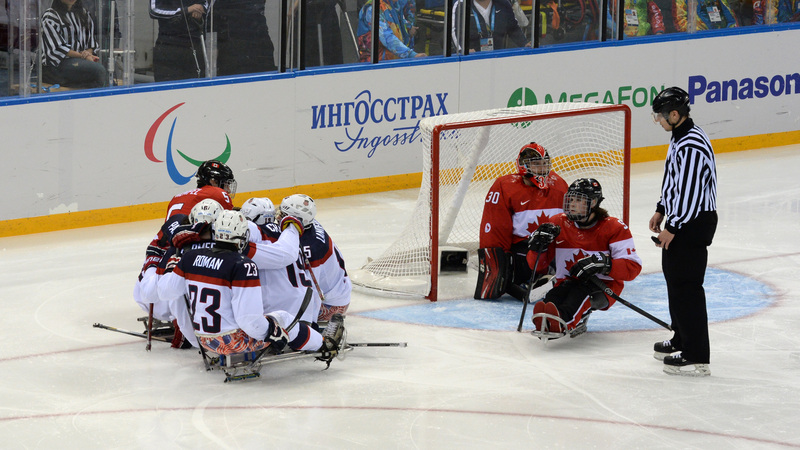 10-time Summer medalist Tatyana McFadden (above, left) won our hearts by taking silver in the women’s nordic 1km sprint (sitting) after less than a year of winter training – and by doing it in front of both her Russian birth mother and the adoptive family who brought her up. 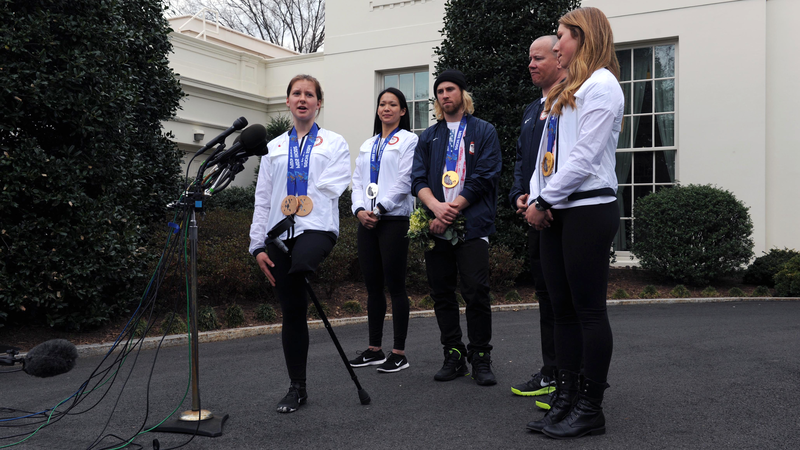 Watching her win – and her grimace as she realized she’d come within a fraction of a fraction of a second of gold – suggests she’ll be back and gunning in the next Winter Games. 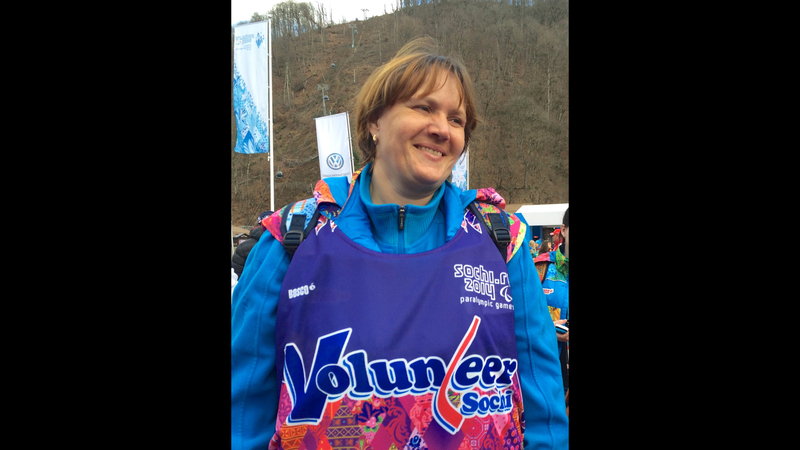 Her sit-ski teammate Oksana Masters earned two medals, a silver and a bronze. 2. 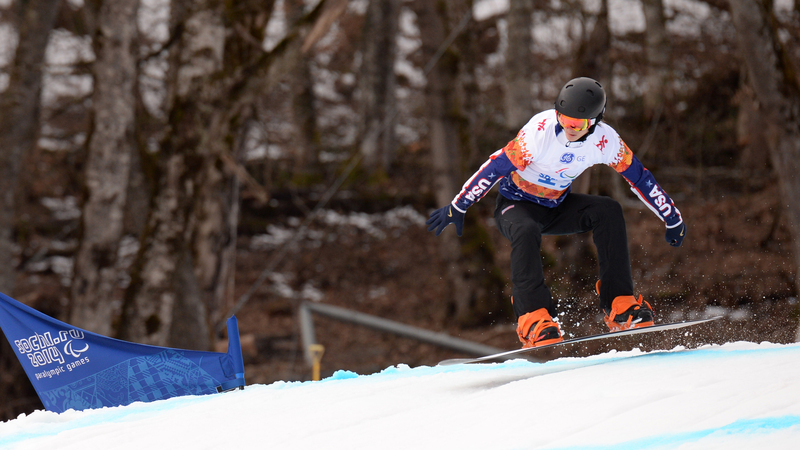 The new sport of snowboard cross was a chance for Team USA to reaffirm the sheer American-ness of this sport. 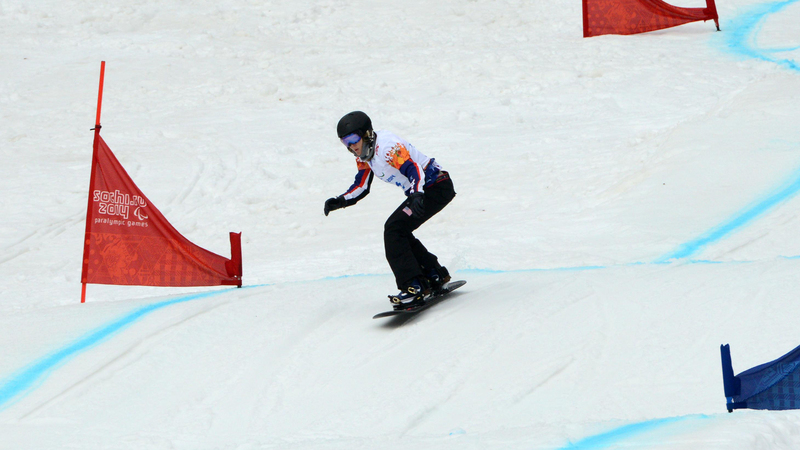 Led by Evan Strong (above), the US men swept the podium, and Amy Purdy brought home a women’s bronze, with two teammates right behind her in fourth and fifth places. 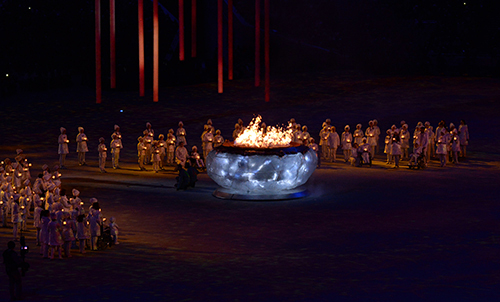 Two weeks ago, the Sochi 2014 Paralympic flame was extinguished, dramatically, in a bowl of ice. 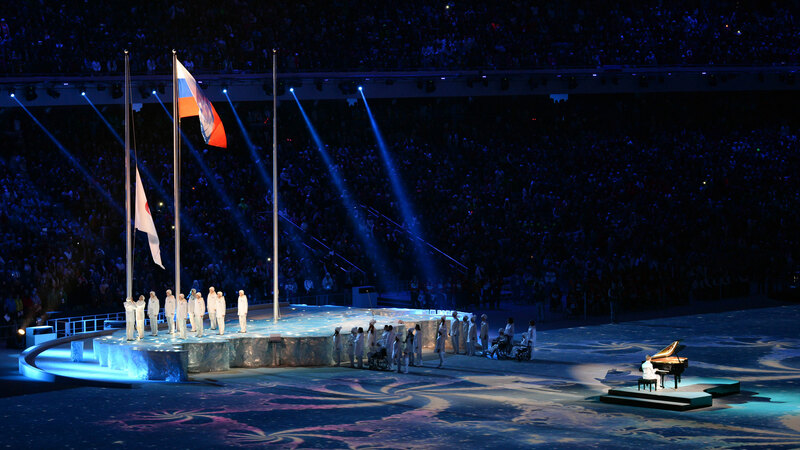 The Paralympic flag was handed over to South Korea, the next host for the Winter Games. 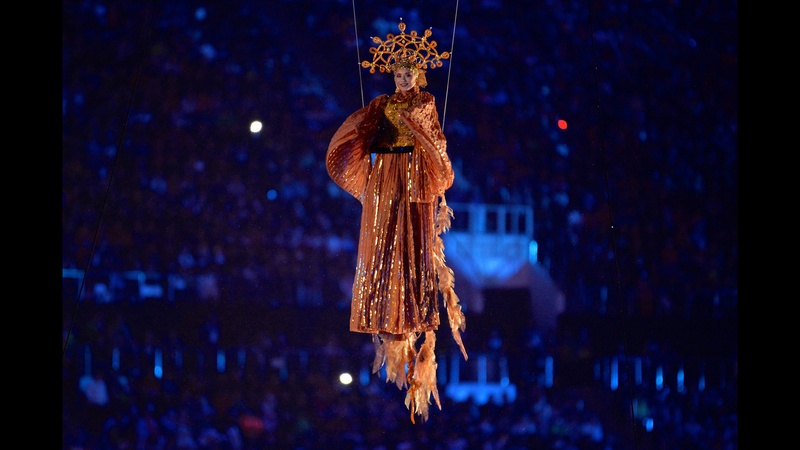 The 2014 Games began under a cloud that was eerily reminiscent of the past. 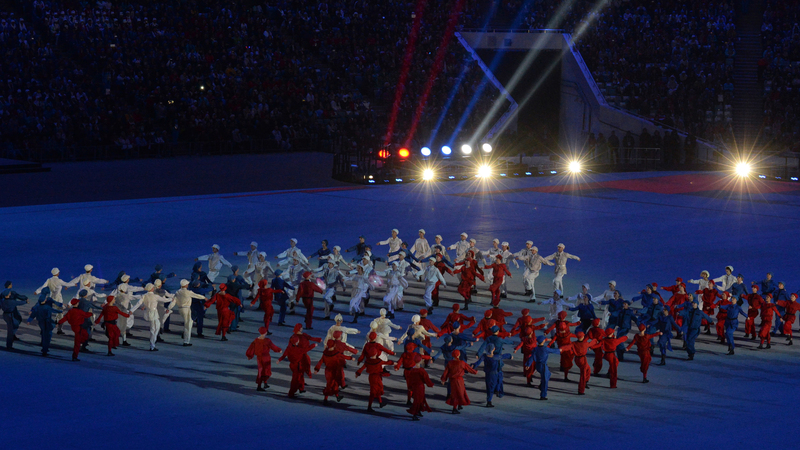 In the 1980 Summer Games, the US withdrew its athletes from competition in protest of the Soviet incursion into Afghanistan. America was joined by Japan, West Germany, China, Canada, and other nations. 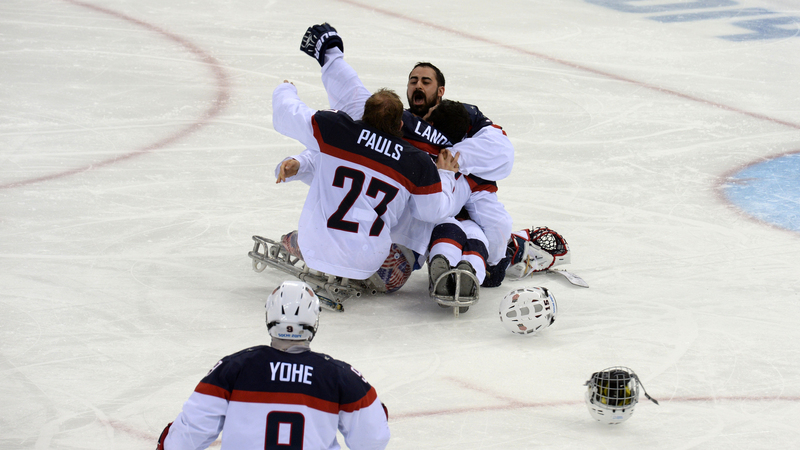 It’s just an expression used to describe a top win – “bringing home the gold.” But there’s a literal meaning to those words, as the USA Sled Hockey team discovered, and it’s pretty wonderful, too. 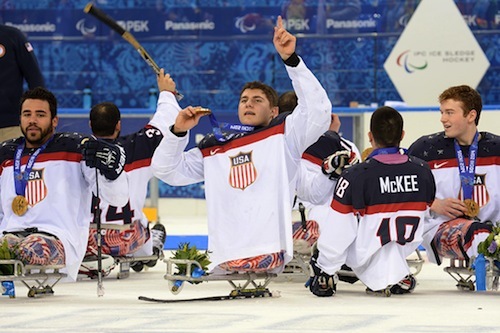 For Brody Roybal, it meant arriving home in Northlake, Illinois, to find hundreds of people in front his house chanting “USA! 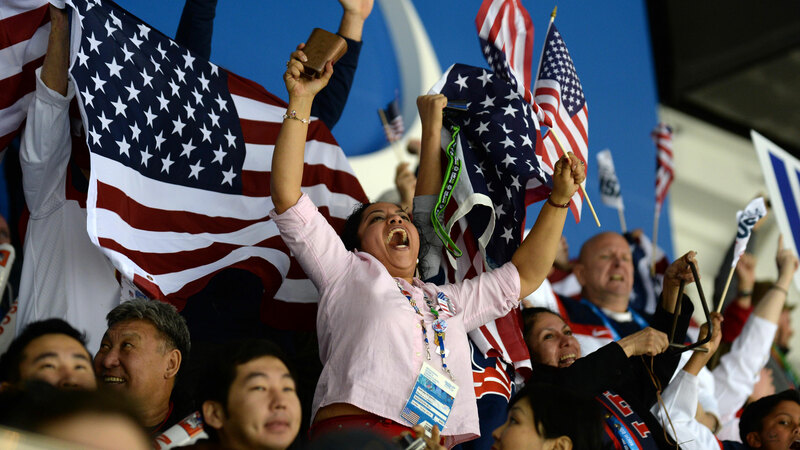 USA!” The crowd included family, friends, complete strangers, news reporters, and his West Leyden High School classmates. Just before leaving for Sochi, Brody had promised his school to do his best to “bring home the gold.” Mission accomplished. 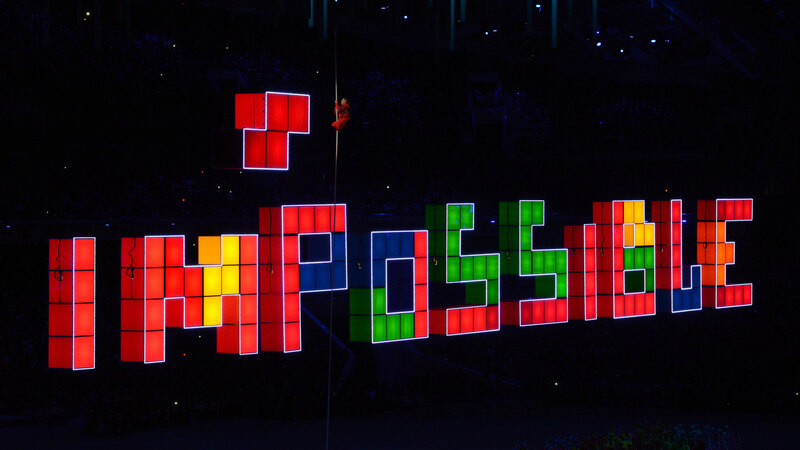 So it was fitting that tonight’s Closing Ceremony was titled “Reaching the Impossible.” The idea was brought to life in a sequence patterned on a video game, propelled by dancers moving giant multi-color blocks. Suddenly, the blocks rose to form the word IMPOSSIBLE as a countdown clock reached zero and “GAME OVER” flashed. 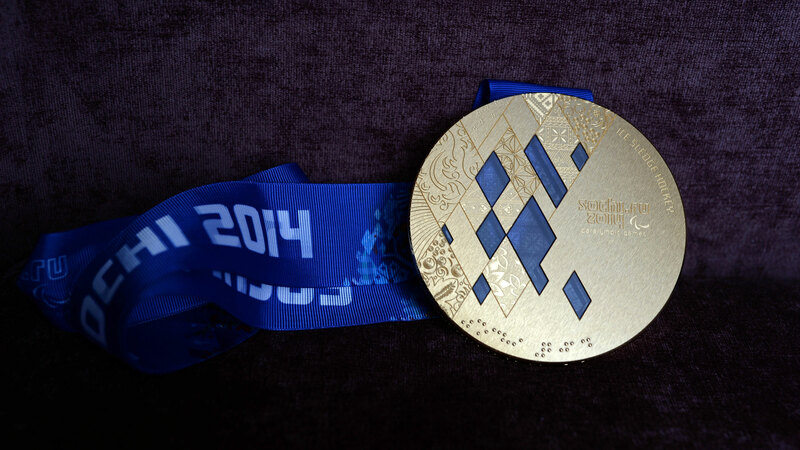 · Gold medals are heavy - more than a pound and a half in total, shards of thick reflective glass set in a silver core and 24 karat gold exterior. 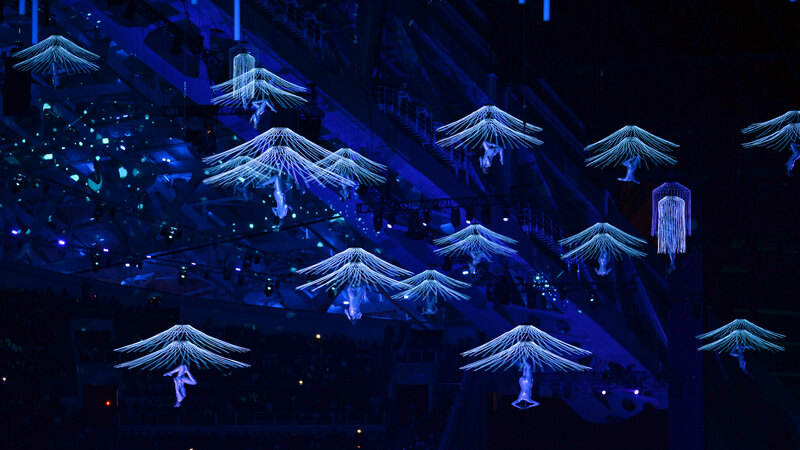 The imagery engraved on them represents the sun's rays reflected through snowy mountains, and the temperate Black Sea coast next to Sochi’s icy peaks. 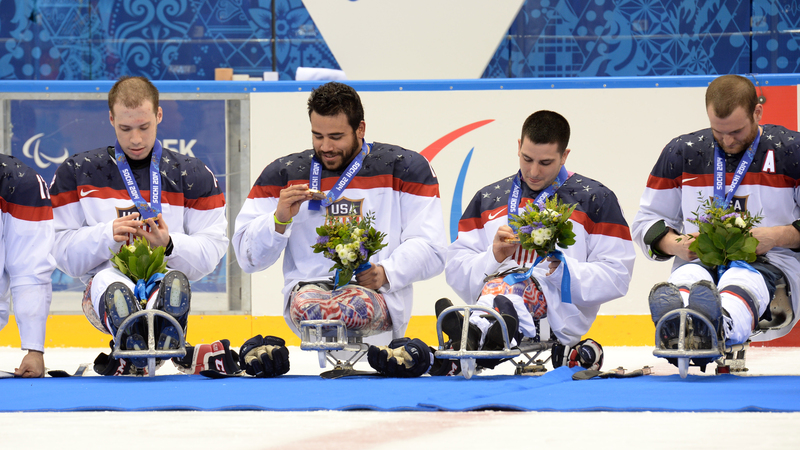 The American players were holding on tightly to theirs, but also sharing: “Would you like to wear it?” So ICE WARRIORS can attest to how great that weight feels hanging around your neck. 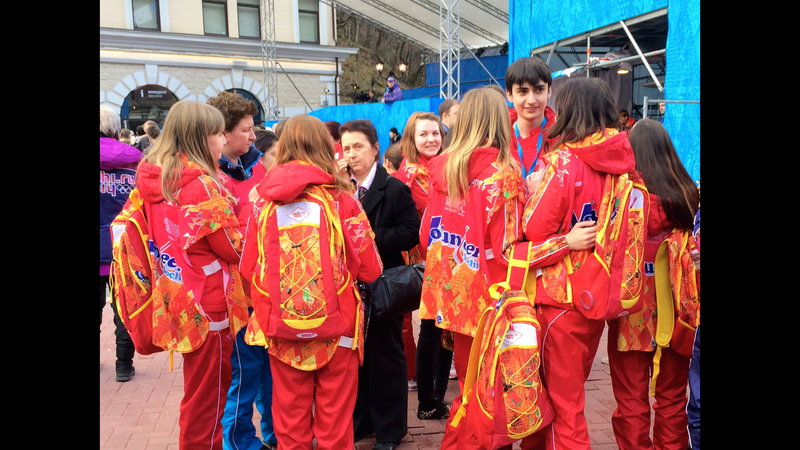 · Team USA was jubilant after the Games, and ICE WARRIORS was there as they got on their bus back to the hotel. 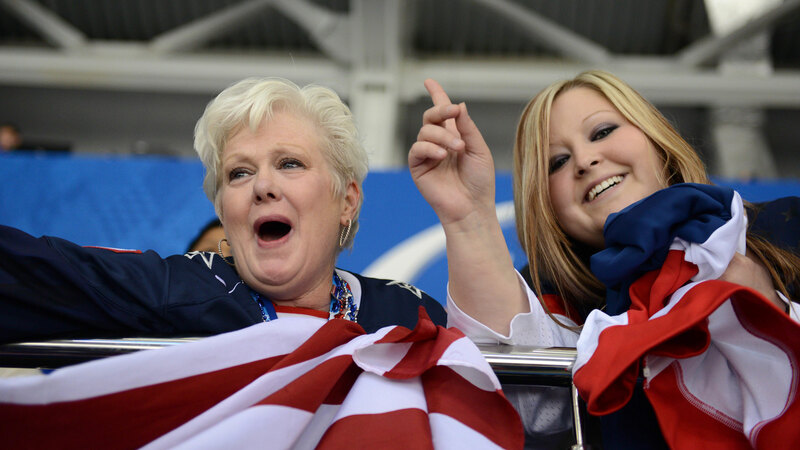 We’d heard them, many times over the months we’d filmed the team, cheering “ USA! 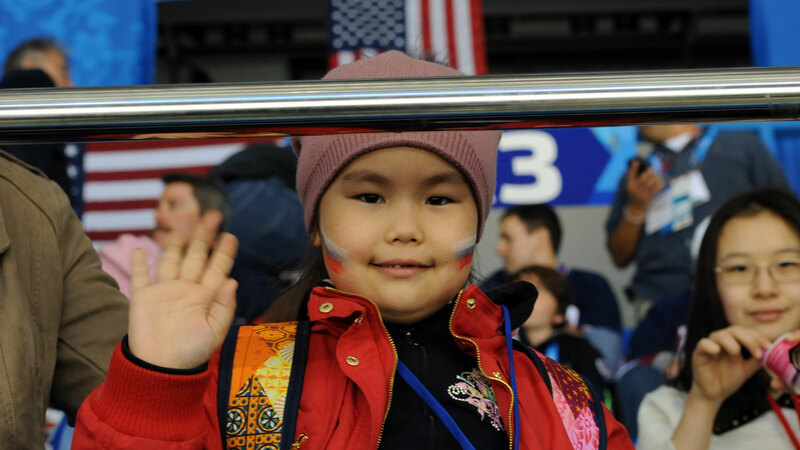 USA!” before and after games. Now they were saluting each other: “BROOODY! !” “ JOSHHH!! 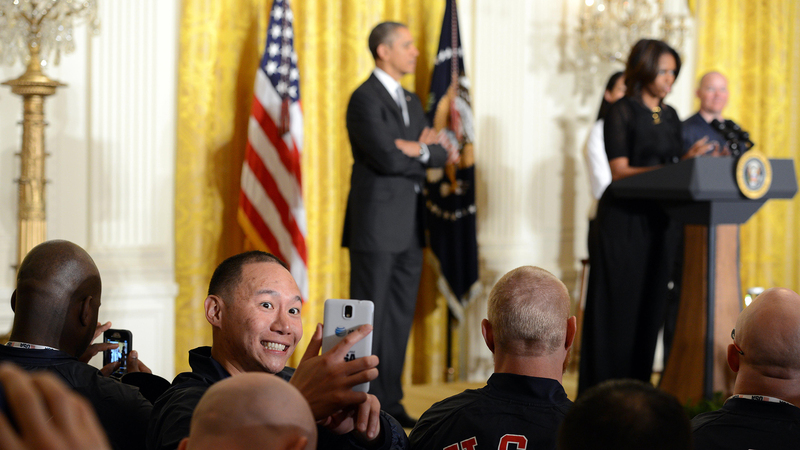 !” And then, to the ICE WARRIORS team’s amazement, they cheered us: “PBS! 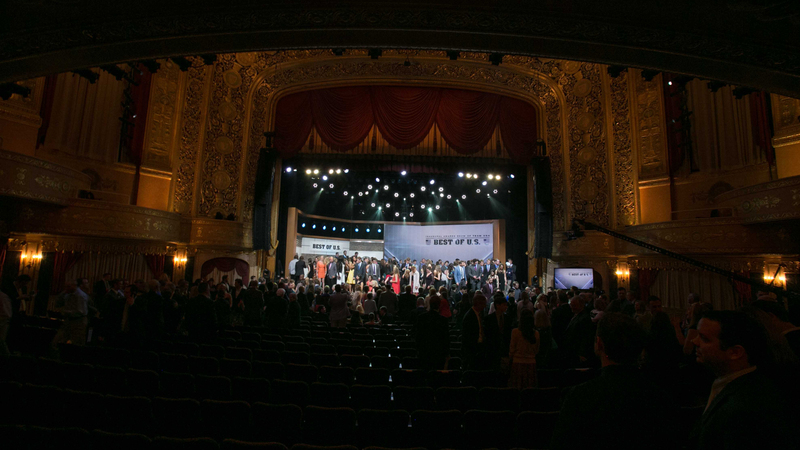 PBS!” We were humbled. 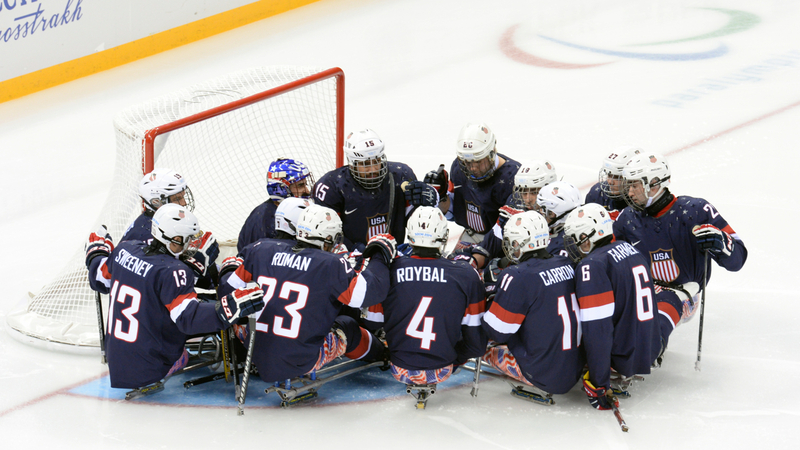 Watch the team's journey to victory in ICE WARRIORS. 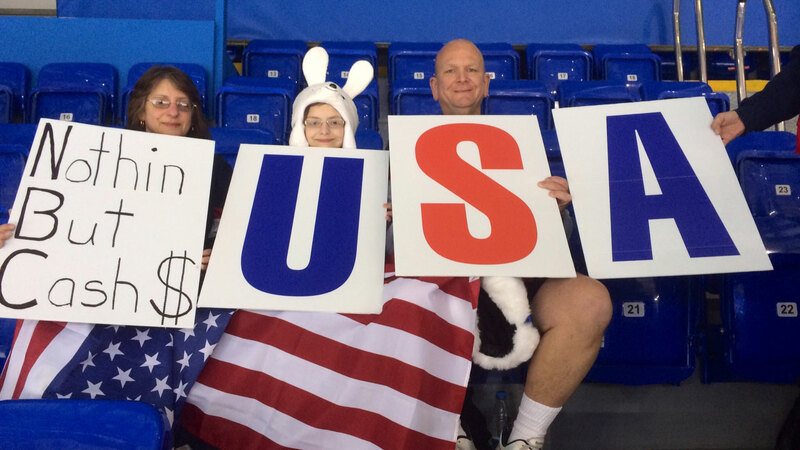 We're big fans... of sled hockey fans. 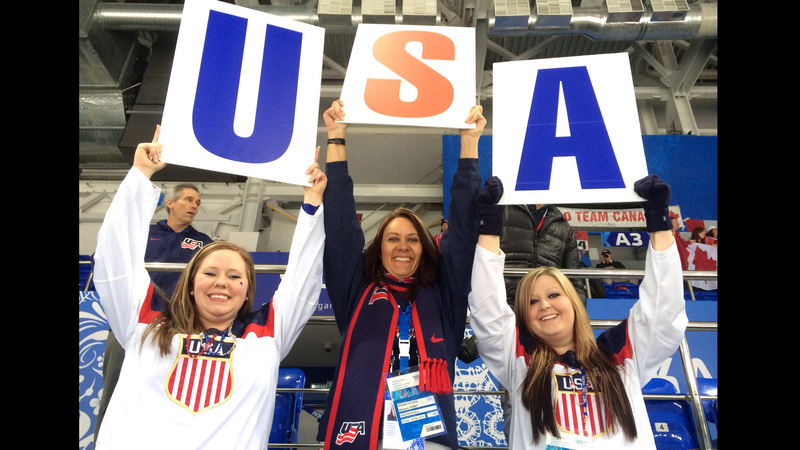 Take a look at some of our favorite gold medal game fans! 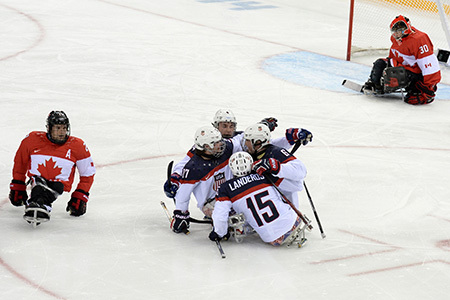 The most important game of their lives, for both Team USA And Team Russia, came down to just one goal. Josh Sweeney (#13), who put that goal in the net, said he knew the Russian goalie, Vladimir Kamantcev, was a big presence in goal. So when Sweeney made a fast steal from a Russian defender, he did a little fake-out move, got Kamantcev to commit, and shot past him. It was enough. 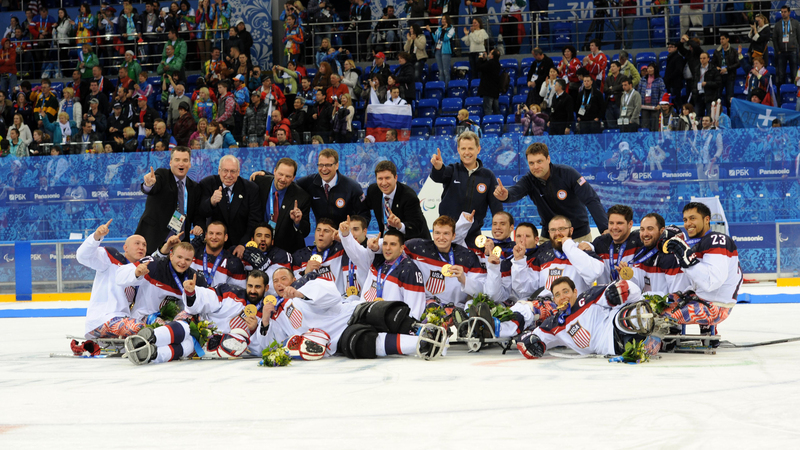 Team USA is bringing home gold, the first sled hockey team ever to win back-to-back gold medals. 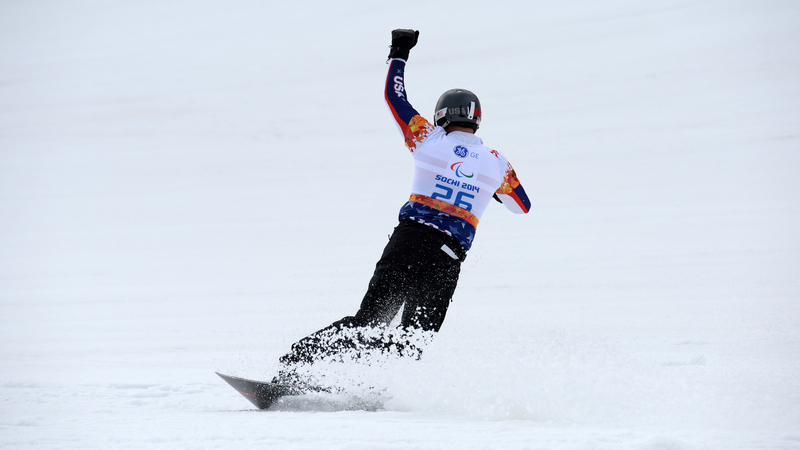 Snowboarding made its official debut at the Paralympics, and Americans bagged four of the six medals. 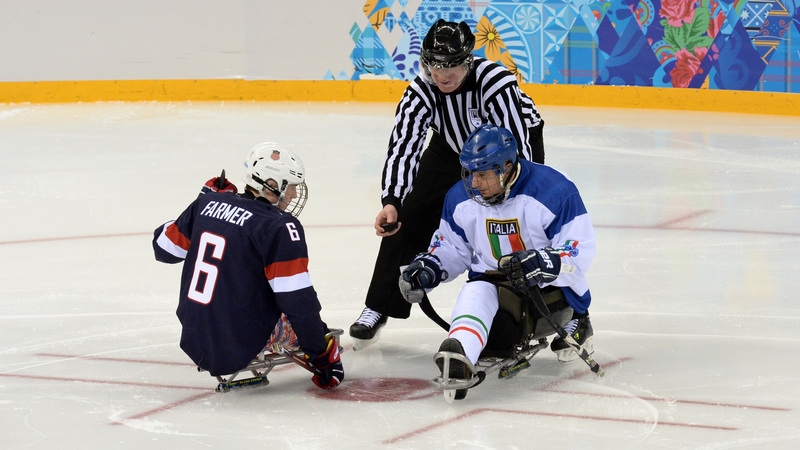 Game 4 of the 2014 Paralympic sled hockey competition could not have been more highly anticipated. 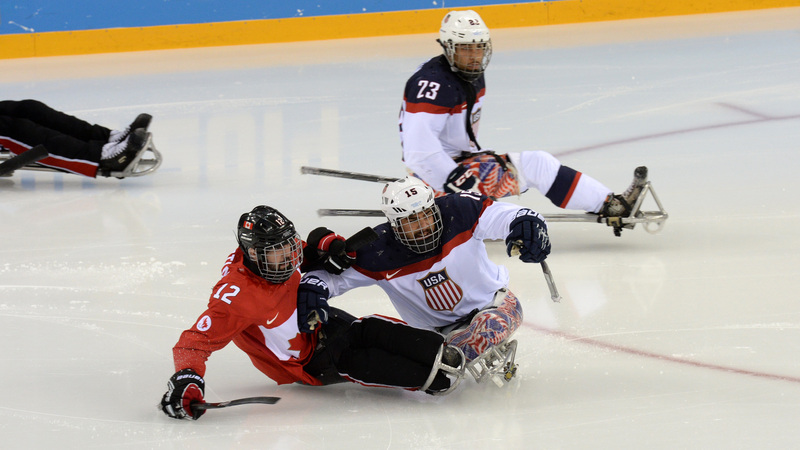 The US and Canadian teams have battled so often and so hard, the players know their opponents almost as well as they know their teammates. 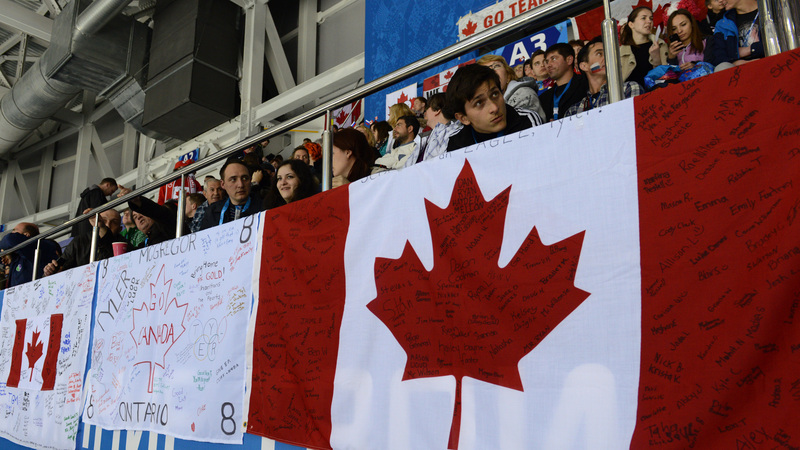 In the 2013 World Championships, Canada came out on top, and they beat the Americans again in Toronto later in the year. 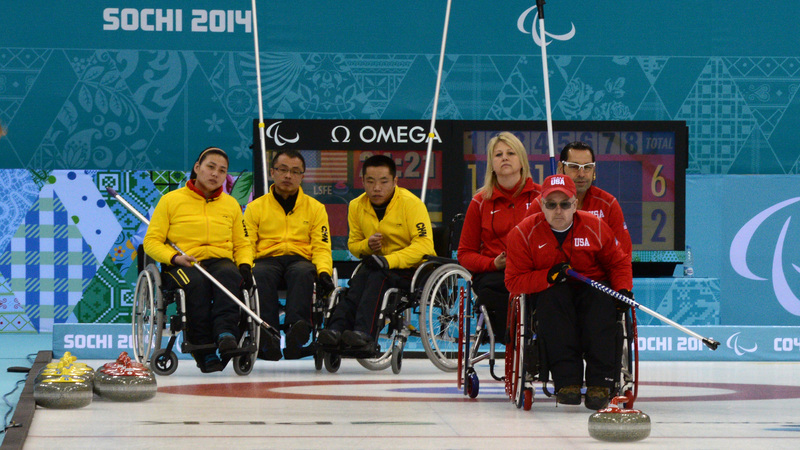 But the US won the last two match-ups, in January, before heading to the Paralympics. The stage was set for tonight’s game, a must-win for Team USA to keep their gold medal hopes alive after Tuesday’s tough loss to Russia. 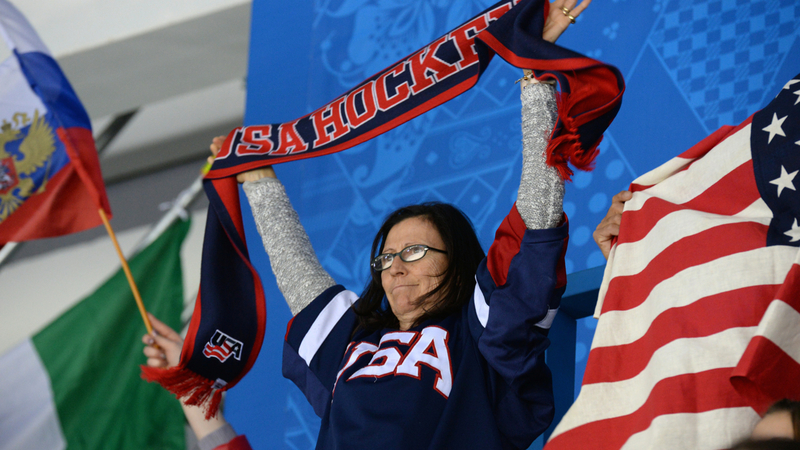 Everyone on Team USA knew that Game 4 was a must-win to keep their gold medal hopes alive after Tuesday’s tough loss to Russia. 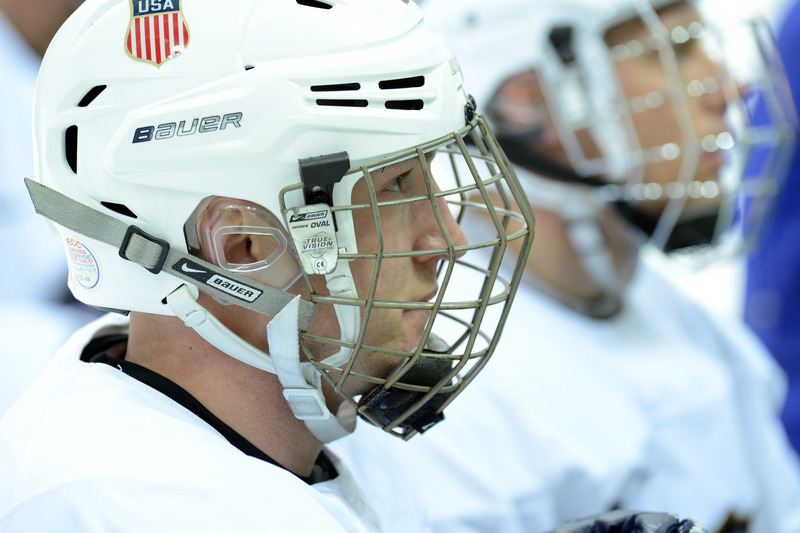 Both the Americans and the Canadians came out with tremendous focus and a lot of scrappy play, but Declan Farmer scored first for the US 9:12 into the game, then again at the end of the period. Five minutes into the second, Farmer notched an assist as he found Josh Pauls, who shot and brought the score to 3-0. 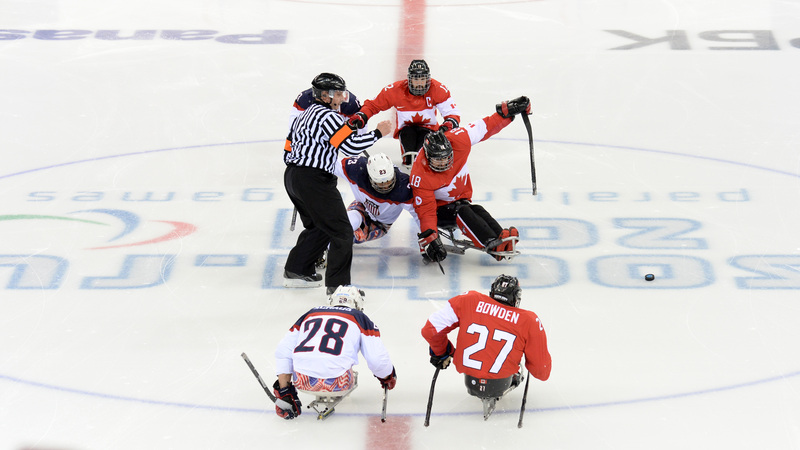 Canada was fired up in the third, trying hard to score, but Steve Cash played another perfect game, stopping all eleven shots on goal. 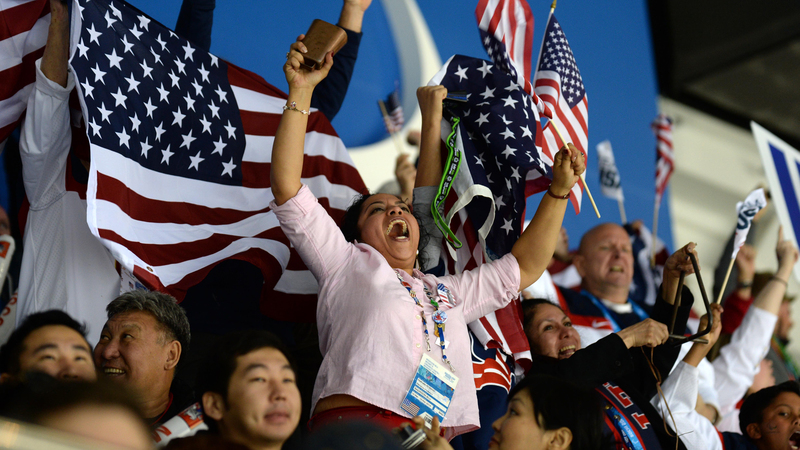 Team USA is headed for a rematch against Russia in the gold-medal finals on Saturday night. 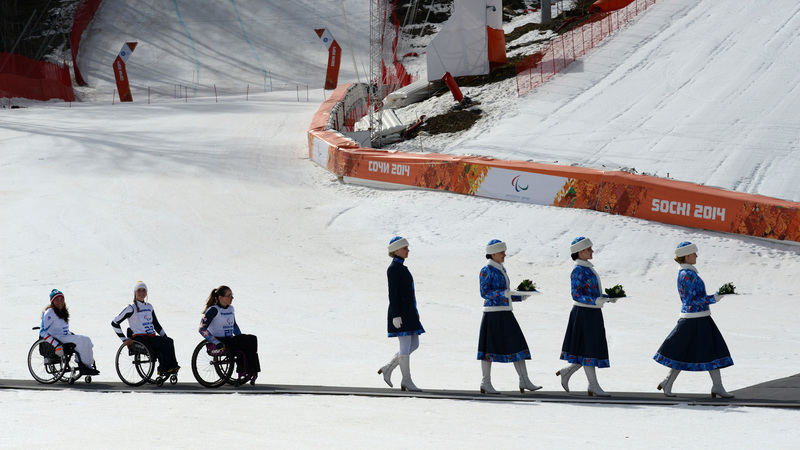 Tatyana McFadden (left) added to her Paralympic record (10 Summer medals) by winning silver in the women's 1km cross-country sprint. 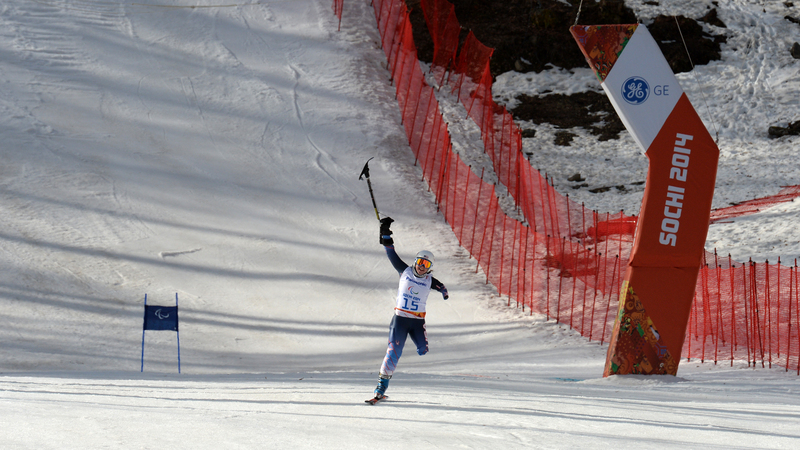 Less than a year after pushing off for the first time in her cross country sit-skis, she came within a tenth of a second of the gold, won by Norway's Mariann Narthinsen. 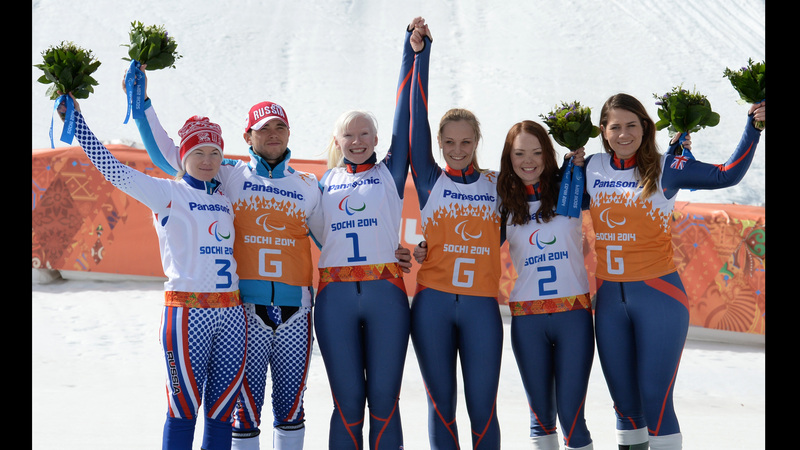 The 1km sprint consists of a qualification (Tatyana came in 4th), a semifinal (she came in 2nd), and a final. 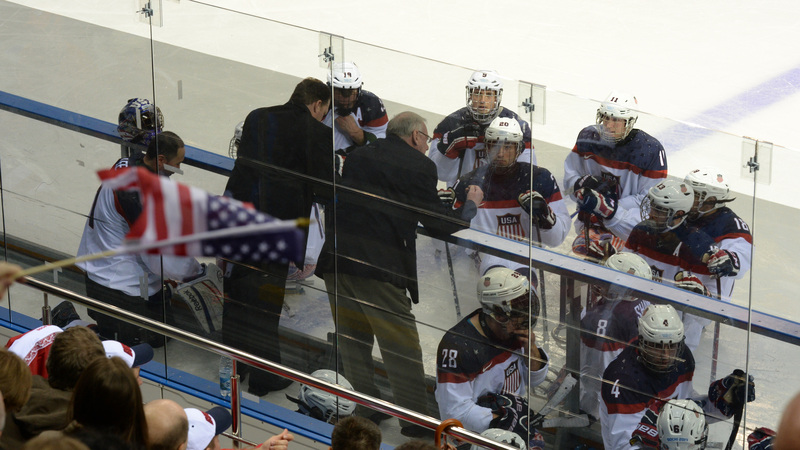 With wins under their belts from the first two games, Team USA knew they would be in the semi-finals. 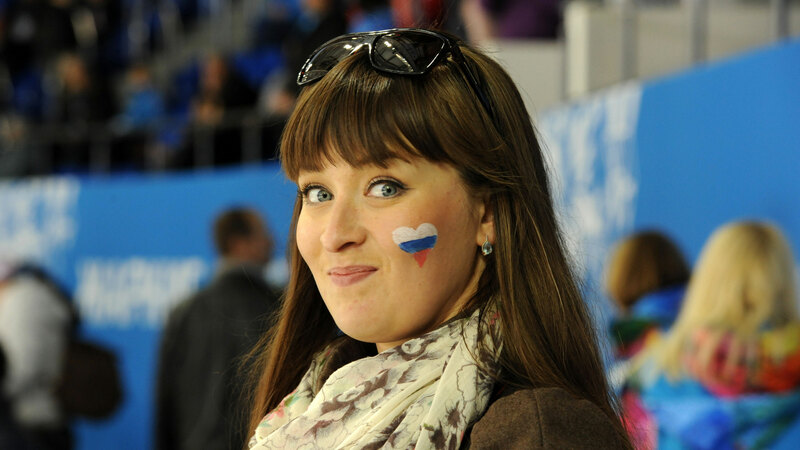 Team Russia, with a 1-1 record, did not. So both teams came to skate hard in a game that was ultimately decided in the final minutes of play. Well before the first period ended, though, the game was already historic. 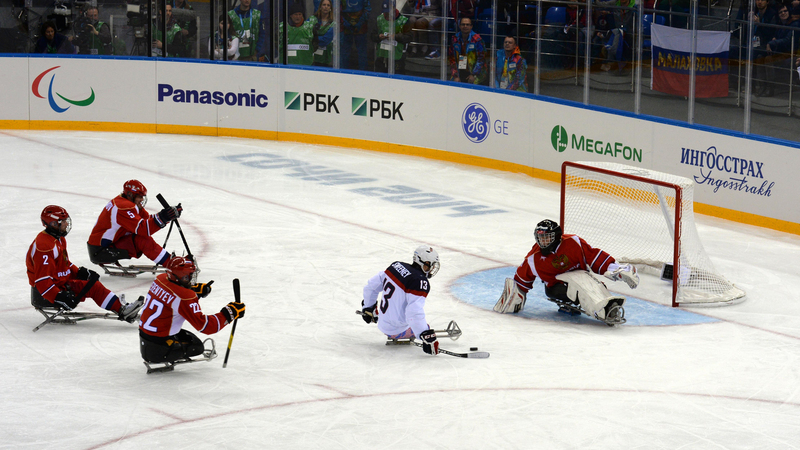 At 11:57 Russian forward Ilia Volkov scored, breaking Steve Cash’s perfect record – no goals were scored against him in the past seven Paralympic Games, stretching back to Game 1, Vancouver, 2010. Both Andy Yohe and Paul Schaus were in the penalty box at the time, giving the Russians a two-man edge that they quickly took advantage of. 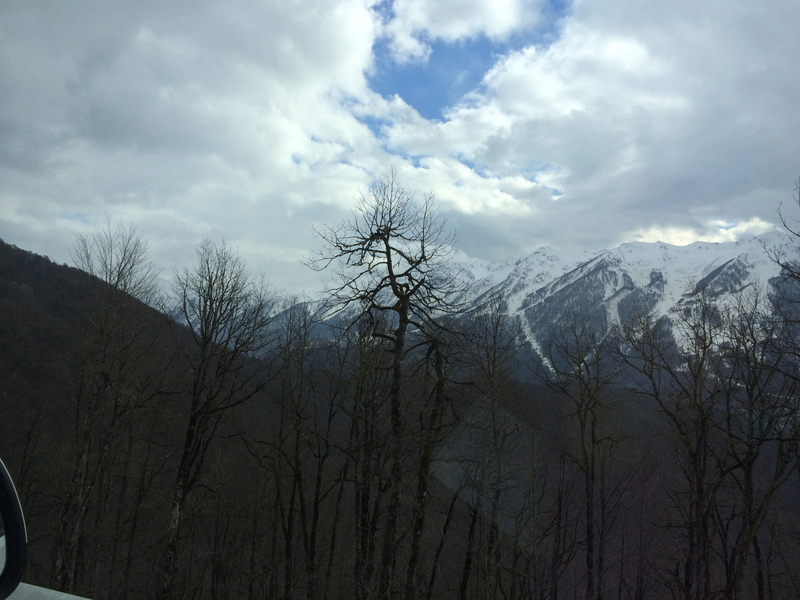 It was a beautiful, warm, sunny day at the Rosa Khutor Alpine Center. 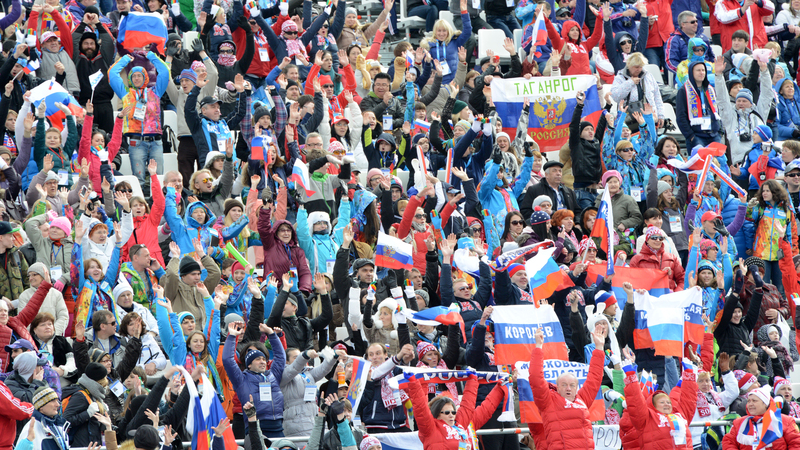 The crowds that packed the stands to watch the women’s super G racing were hardly bundled up at all, having a great time. Not so much for the skiers. 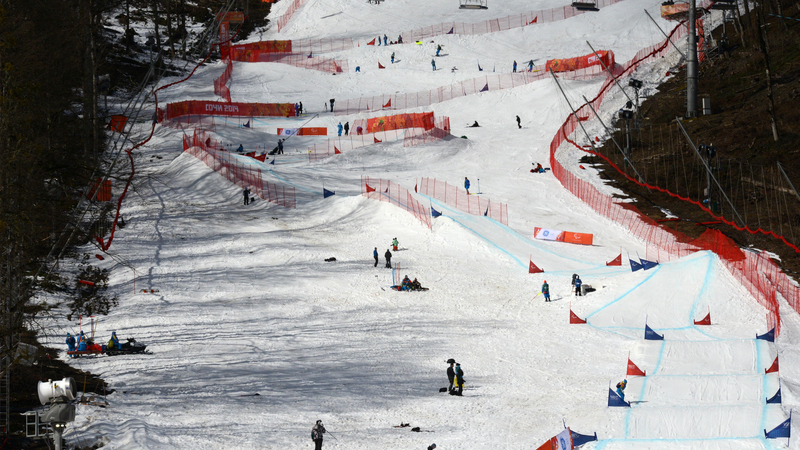 Of the 29 women who started the three super G races, ten did not finish. Most seriously injured were two Americans, who were both helicoptered off the slopes, Alana Nichols and Stephani Victor. Late in the day, Alana posted on Facebook: “I am just fine. I was knocked unconscious and had to have stitches in my chin, but feel incredibly blessed to have left the mountain today in the shape I am in.” She added that Stephani was also banged up but ok.
“Shayba” is a great name for a hockey venue: it means “puck” in Russian. 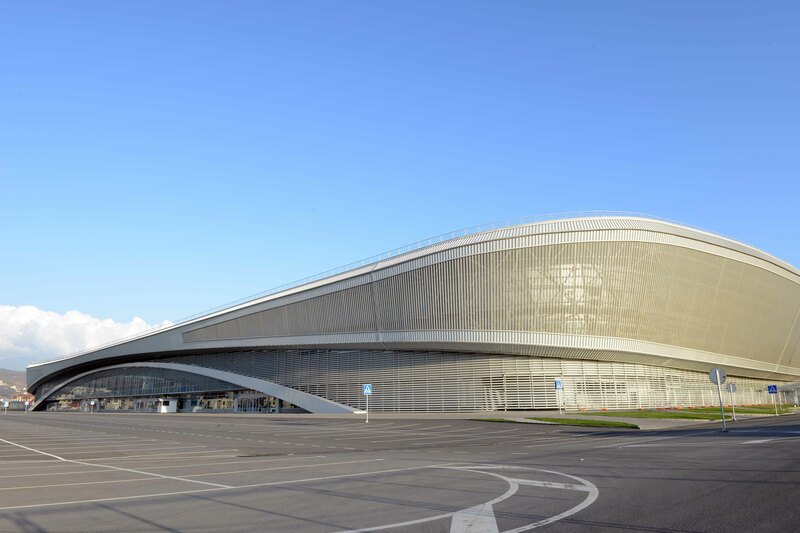 In the Olympic Park, the Shayba Hockey Arena is perfectly round, has a flat roof, and is covered in ice blue and tan diagonal streaks – the perfect image of its name. 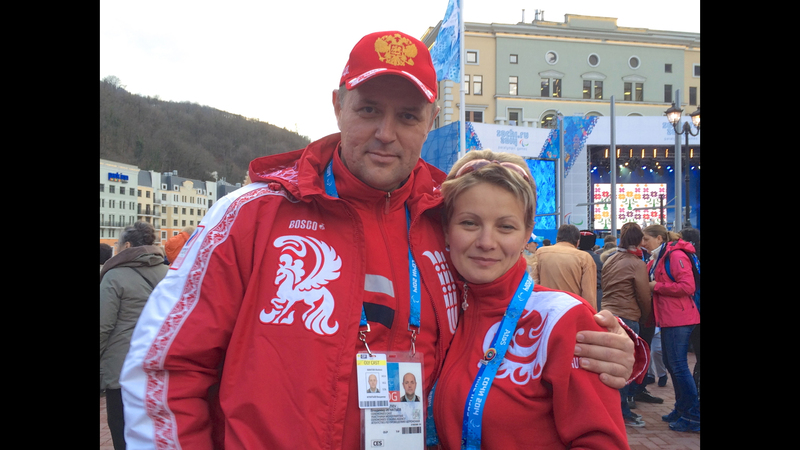 Apparently, “Shaybu!” is also what Russian fans chant to support their team. 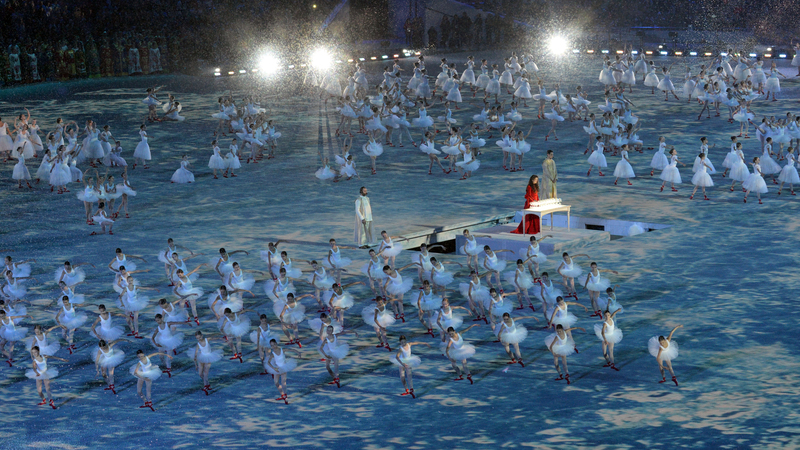 Bagpipes and drums – not what you’d expect in Russian sports. 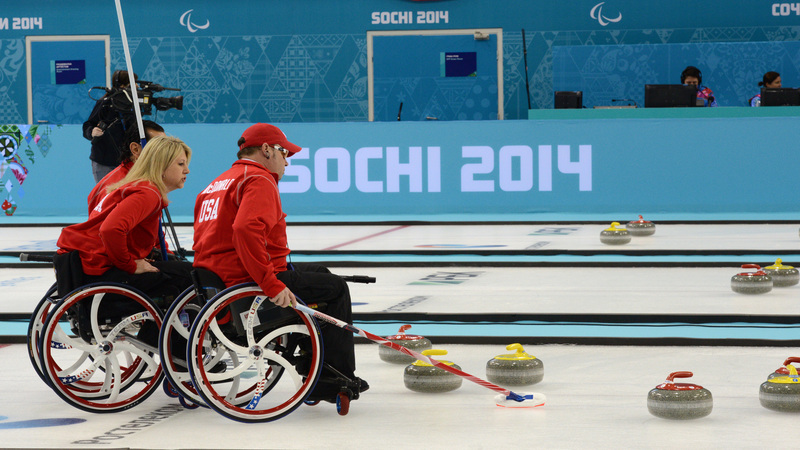 But that’s how the Paralympic curling matches began today, with two pipers and two drummers, in kilts, marching in stately procession along the baseline and right up the middle of the ice. 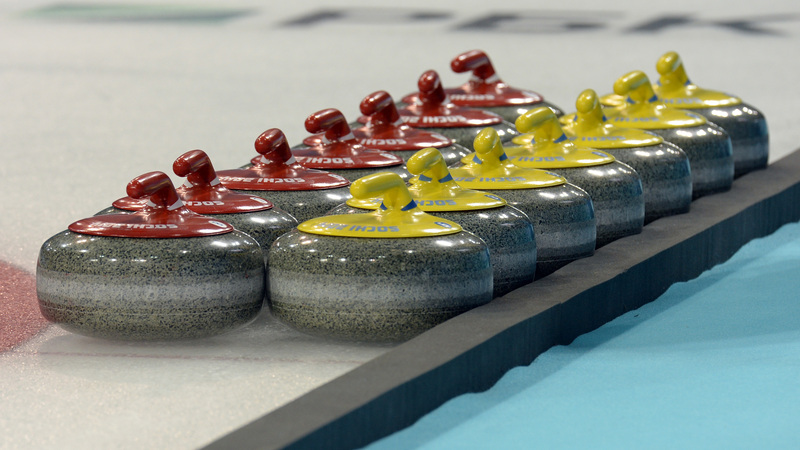 Competition for the curlers began yesterday at the Ice Cube Curling Center. The first six days are a round-robin tournament among the ten national teams; the top four teams go on to the semi-finals. To fit in all 45 games, the schedule is tight, with teams playing every day (sometimes two games a day) and three or four teams playing simultaneously. 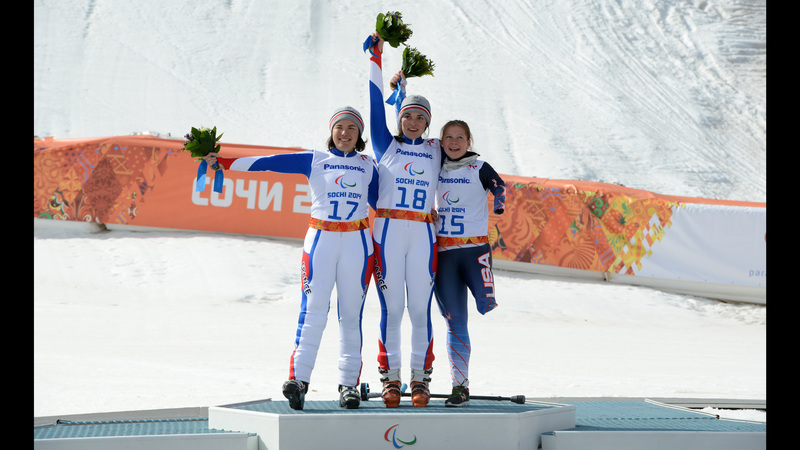 Up in the mountains at the Rosa Khutor alpine center, three Americans made it to the podium on the first day of alpine skiing. 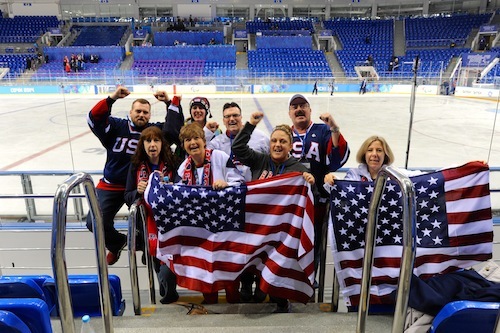 USA Sled Hockey families were pumped after Team USA’s 5-1 win over Italy in the first round of play. 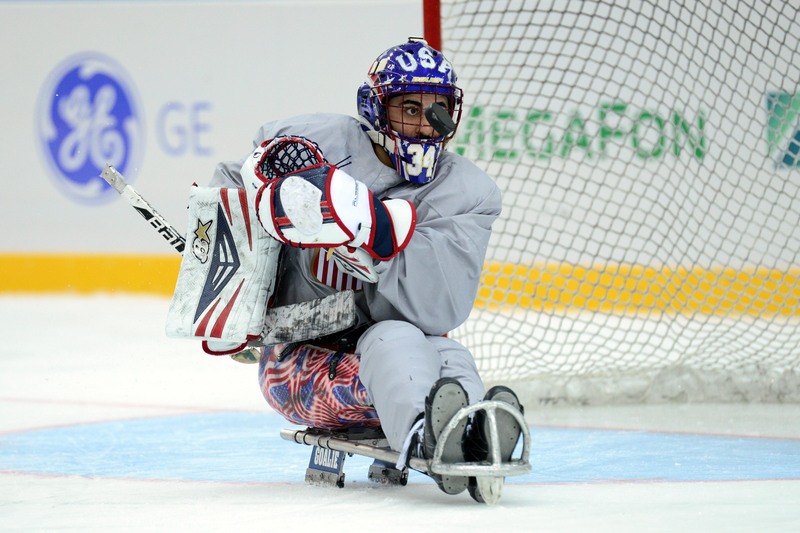 All eight teams of the 2014 Paralympic sled hockey competition played today, on Day One of the Games. 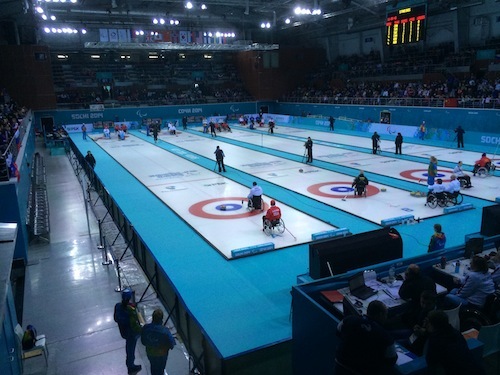 One of the games was a blowout, with Canada grinding down Sweden, 10-1. 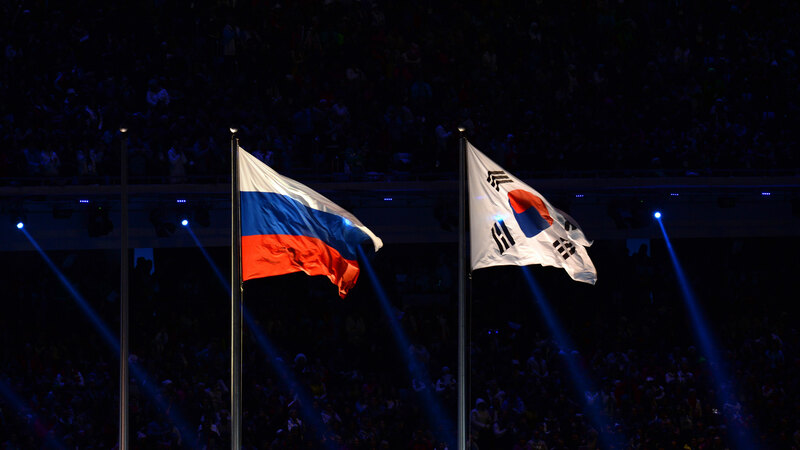 One was a nail-biter: Korea stunned Russia with a 3-2 shootout victory that was the tournament’s first upset. One was a close-fought 3-2 win, Norway over Czechoslovakia, with the Norwegian goalie making 21 saves. 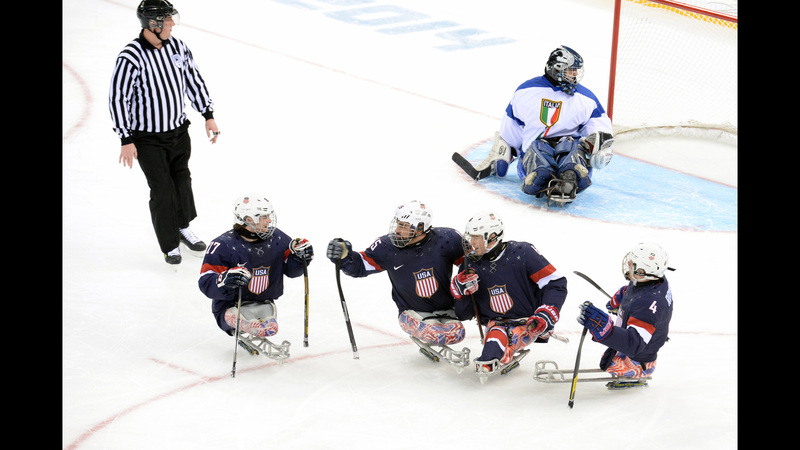 And then there was USA Sled Hockey’s 5-1 win over the Italians. 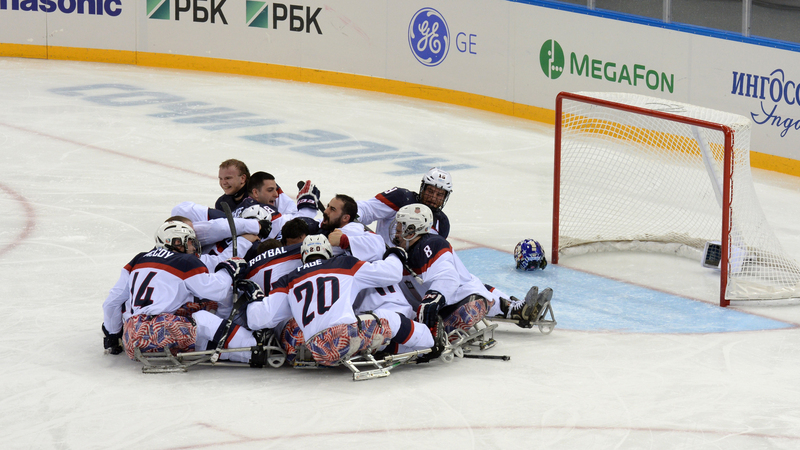 The Americans, as defending gold medalists, were favored to win, but they might not have expected how that win would unfold. Three of the five goals were made by its youngest players. 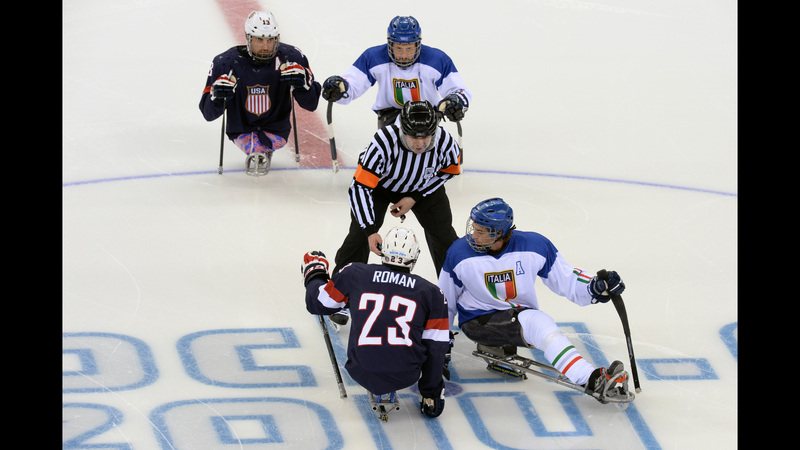 Late in the first period, 16-year-old Declan Farmer ignited the team with its first goal of the Games, and 15-year-old Brody Roybal scored in both the second and third periods, once off an assist from Declan. 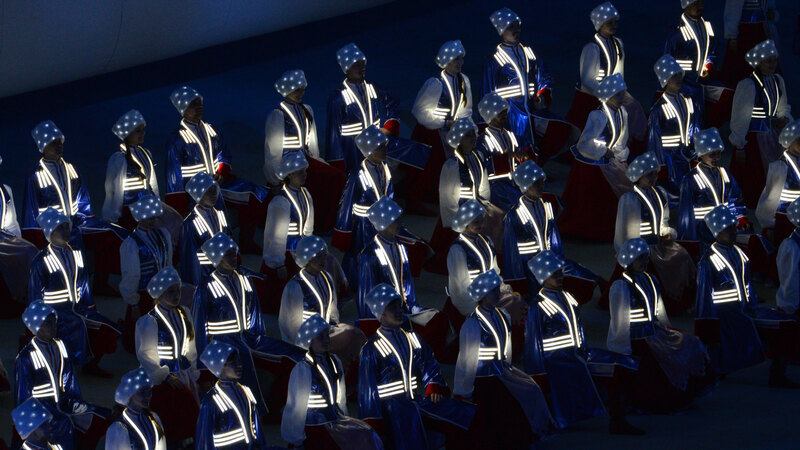 · Precision marchers in red, white, and blue stepping in and out of each others’ lines, weaving intricate patterns and ultimately forming the Russian flag – and then bending in sequence to make the “flag” wave. 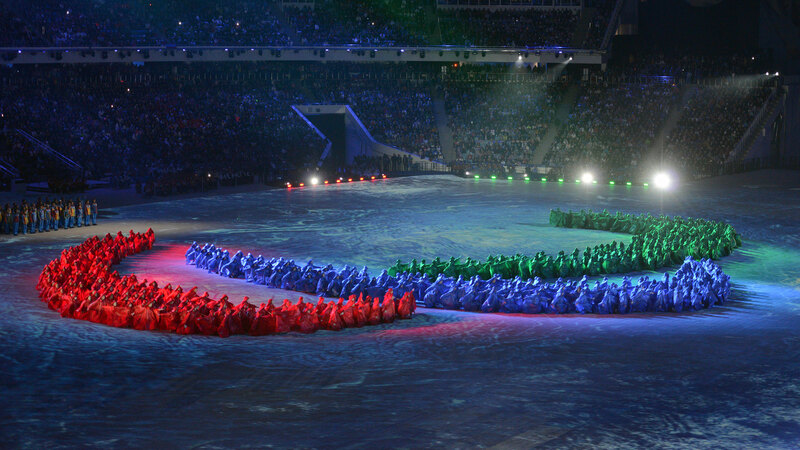 Later in the program, the marchers came back in blue, green and red to march again, this time forming the three Paralympic agitos – the name for the “swooshes” that make up the Paralympic logo. 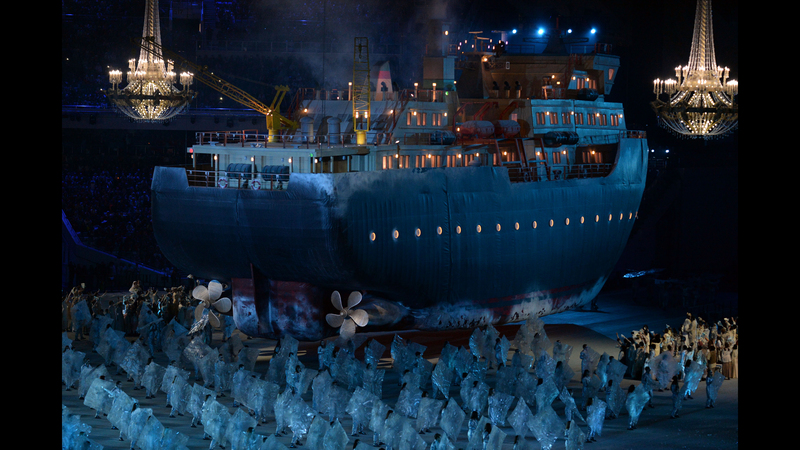 · A giant icebreaker – really huge! 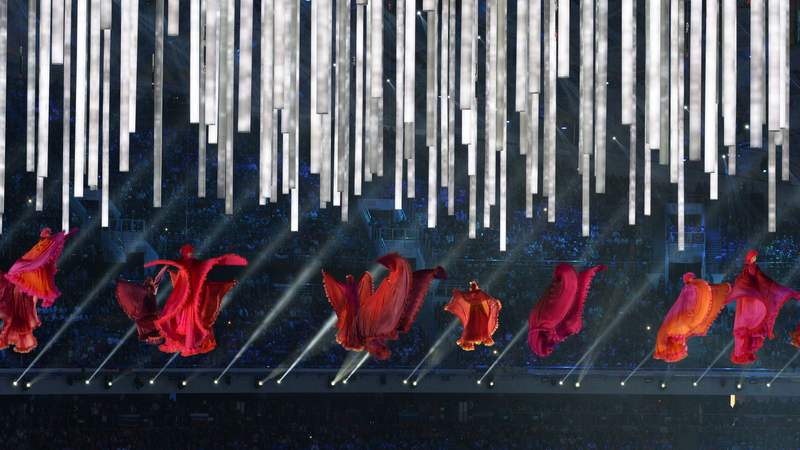 – making its stately way across the Olympic Stadium. 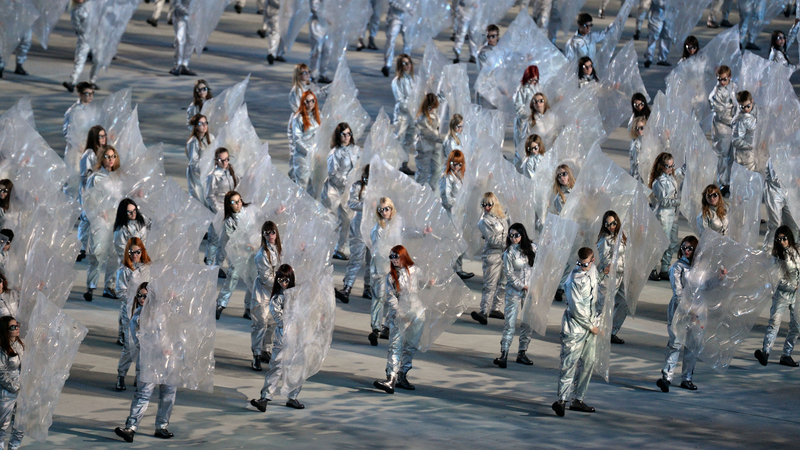 Hundreds of dancers with ice “shards” scattered as it plowed across, symbolizing the Sochi Paralympics’ goal of breaking down barriers for people with disabilities. 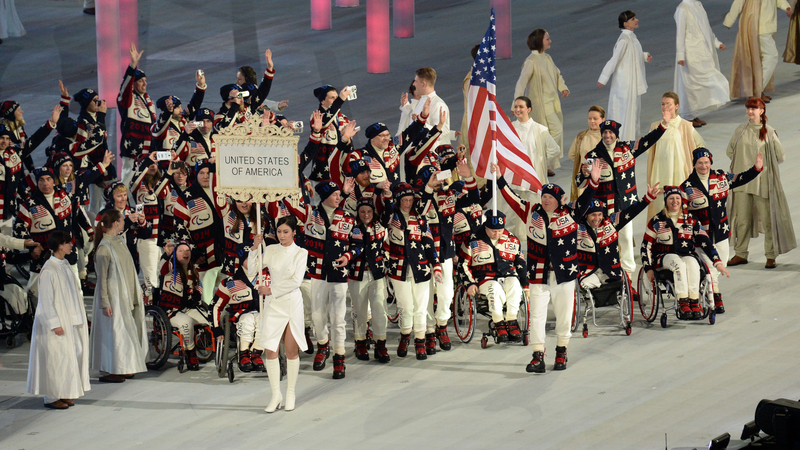 · And, of course, the arrival of Team USA in 2014’s distinctive “ugly Christmas” sweaters. 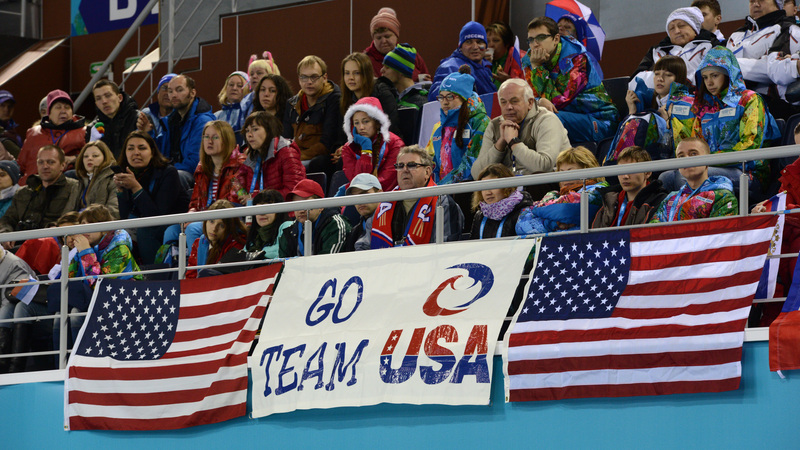 The US athletes looked ready to roll, with competitions in curling, sled hockey, biathlon, and alpine skiing starting tomorrow! 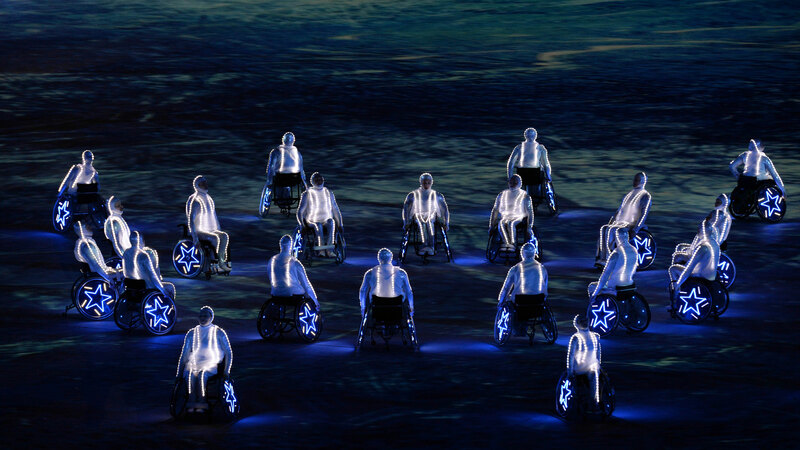 Opening Ceremonies for the 2014 Paralympics are over, and in many ways they were just fabulous – lights, sounds, hundreds of dancers and acrobats, flying ladies and computer graphics, fireworks inside and out of the Fisht Olympic Stadium. 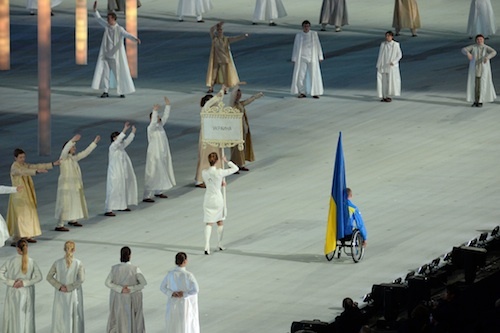 Overshadowing the 2014 Paralympics has been, and still is, the question of Ukraine. 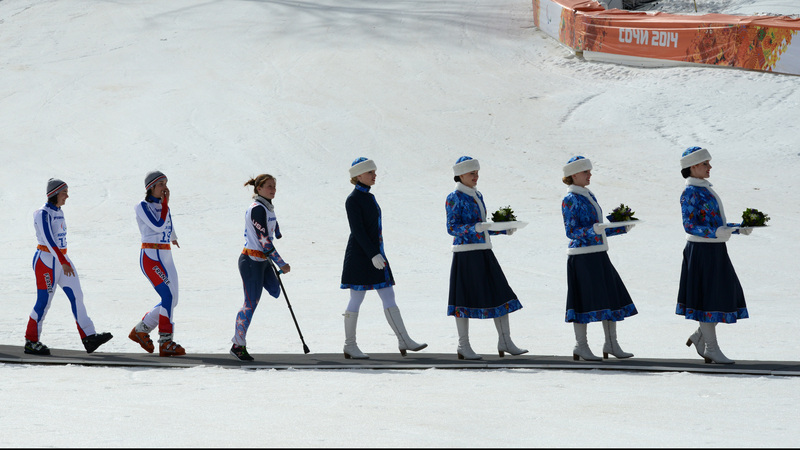 With the threat of a Russia-Ukraine war hanging and world leaders scrambling, the Ukrainian delegation was torn: Should they withdraw in protest, or stay and compete in the Paralympic spirit of neutrality? 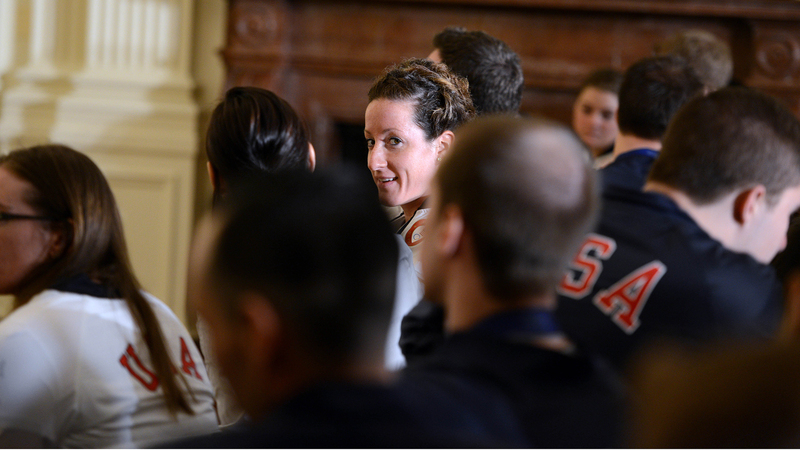 This afternoon, just hours before the Opening Ceremonies, the announcement came: the delegation would participate. 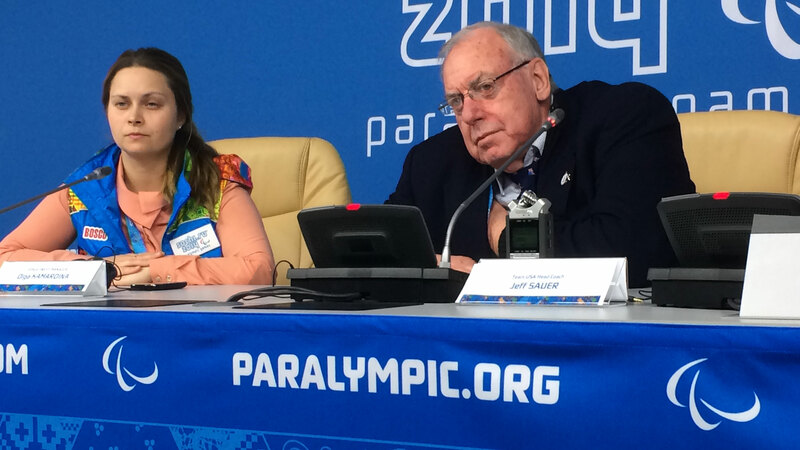 In a press conference, Valeriy Suskevich, Ukraine’s head of Paralympics, made a point of saying, “Don’t let us start a war during the Paralympic Games,” but he also promised his delegation would leave immediately if there was more conflict. 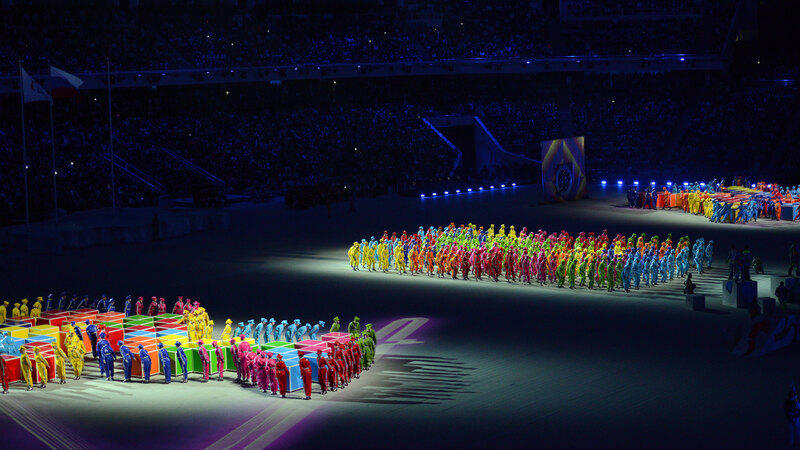 So there was a moment of real drama when Ukraine was announced in tonight’s parade of athletes – and only one person emerged into the stadium wearing Ukraine’s distinctive blue and yellow. 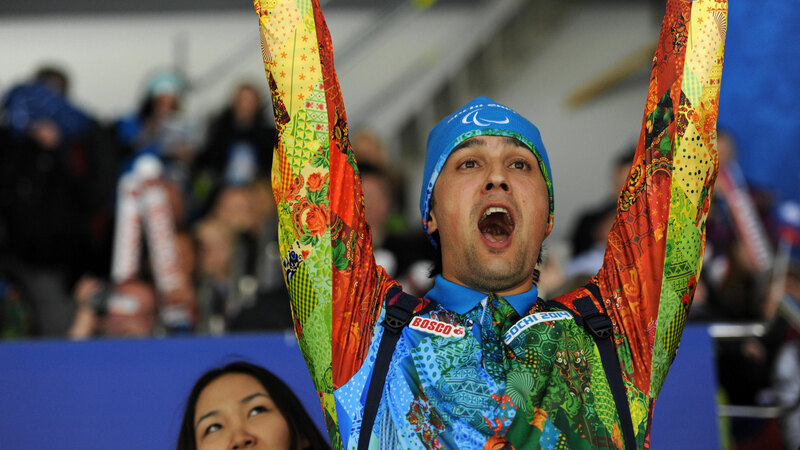 Flag bearer Mykhailo Tkachenko, a biathlon athlete, wheeled his way across the stage with a somber expression on his face. 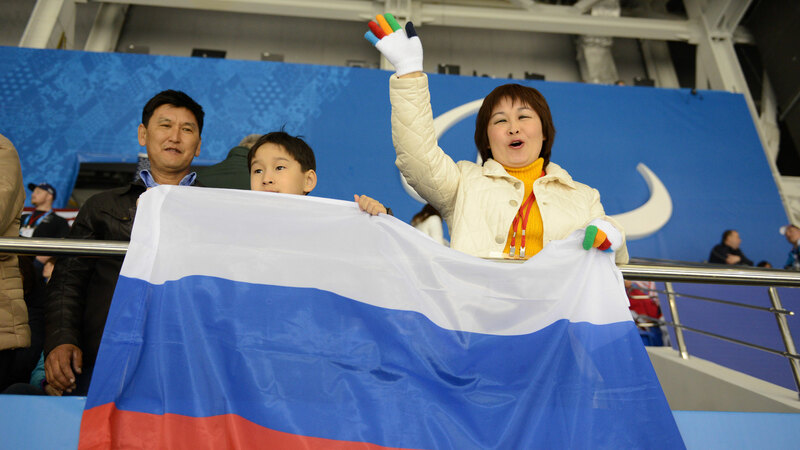 The crowd erupted in huge cheers – the only cheers that were louder were for their own Russian delegation – but Tkachenko never waved or acknowledged the crowd. 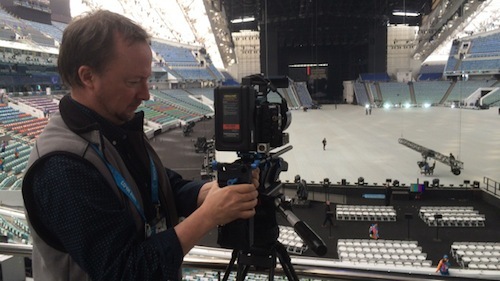 ICE WARRIORS cameraman Scott Sinkler setting up for today's opening ceremonies of the 2014 Winter Paralympic Games. 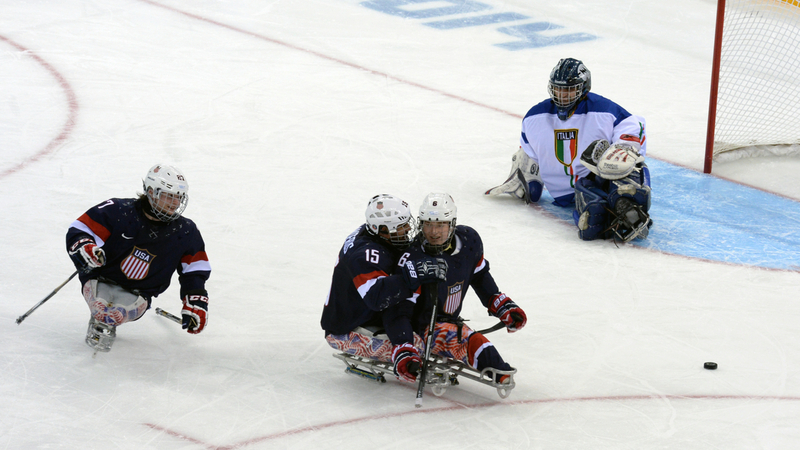 New video will be part of the revised version of ICE WARRIORS, including the USA sled hockey's team performance in Sochi. In the meantime we will be sending photos and news every day. Follow us and share! 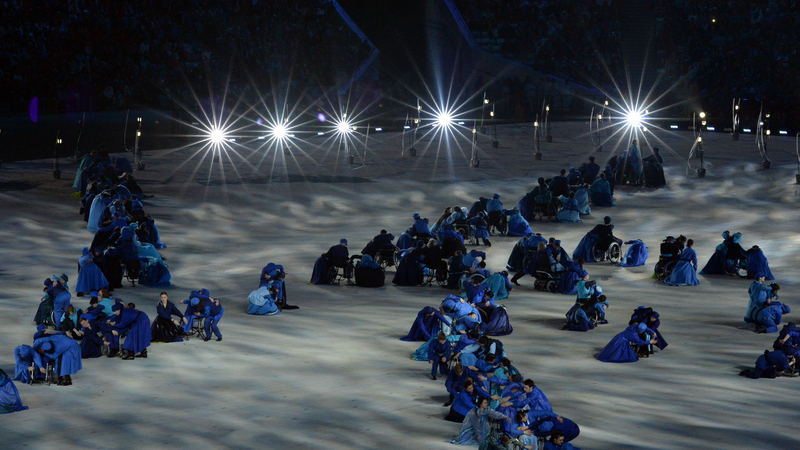 4 hours to Opening Ceremonies, and news reports say Ukraine's delegation will not withdraw from the Paralympic Games. 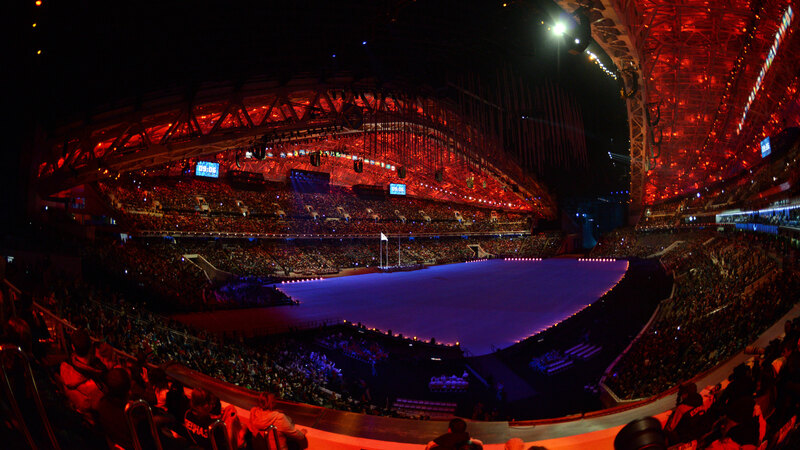 The International Paralympic Committee's president, Sir Philip Craven, who will preside over tonight's opening celebrations, was quoted as saying "The talking point of Sochi 2014 needs to be great sport and great athletes, not global politics." The team will leave if there is an escalation of military conflict. 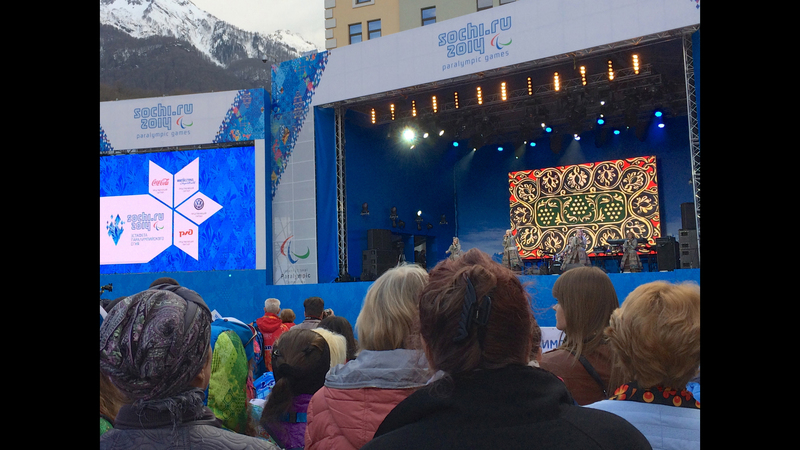 MEDAL QUEST will be sending pictures and reporting from the Fisht Stadium in Sochi later today, after the Paralympic flame is lit and the Games are officially started. 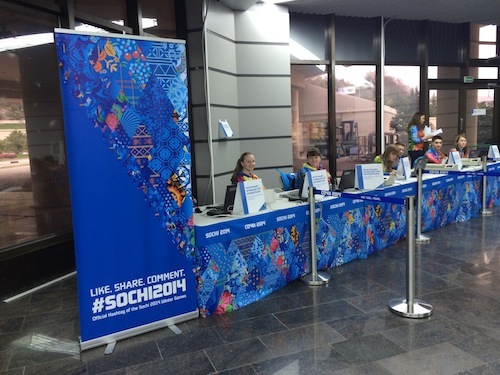 MEDAL QUEST dropped in today at the official first press conference of Sochi 2014, a chance for Russian organizers to discuss what they called “barrier-free standards for the whole of Russia.” This would be huge for any host country, but especially for Russia, which hasn’t had a strong record on accessibility. 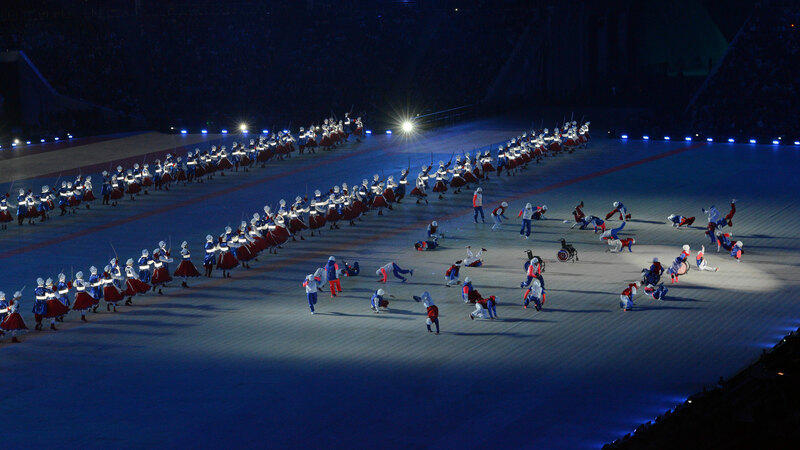 In fact Russia (then the Soviet Union) did not even host a Paralympic Games after the 1980 Olympics. 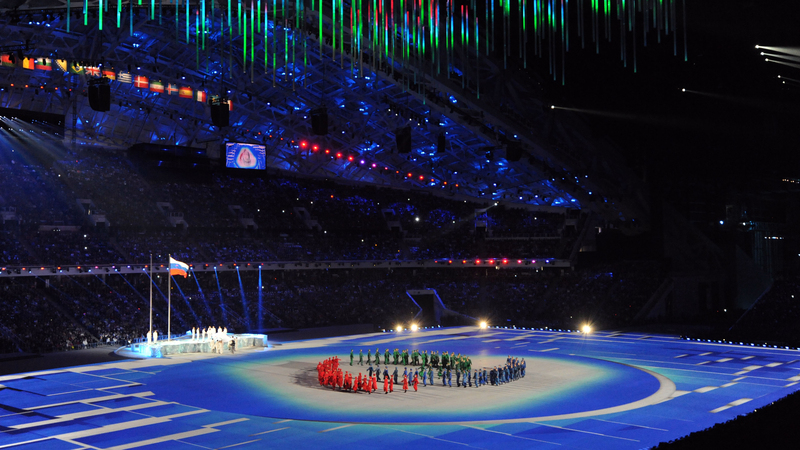 · All 45 national teams have arrived in Russia, a record for the Winter Games. 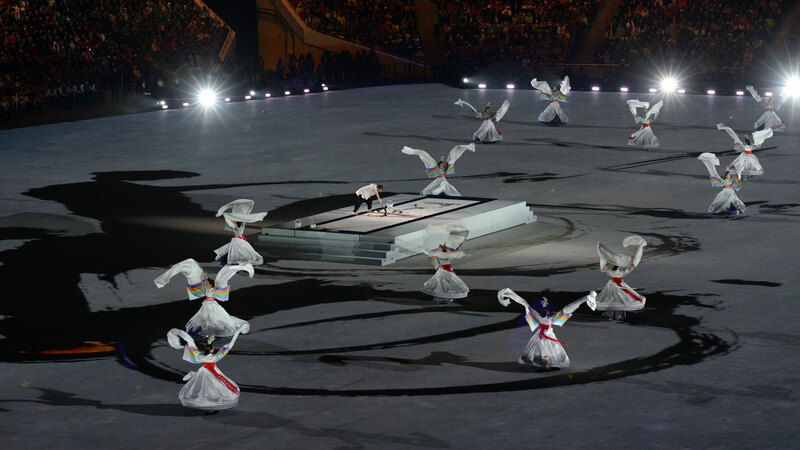 That includes Ukraine’s team, although it’s still not clear if they will withdraw before tomorrow’s Opening Ceremonies. 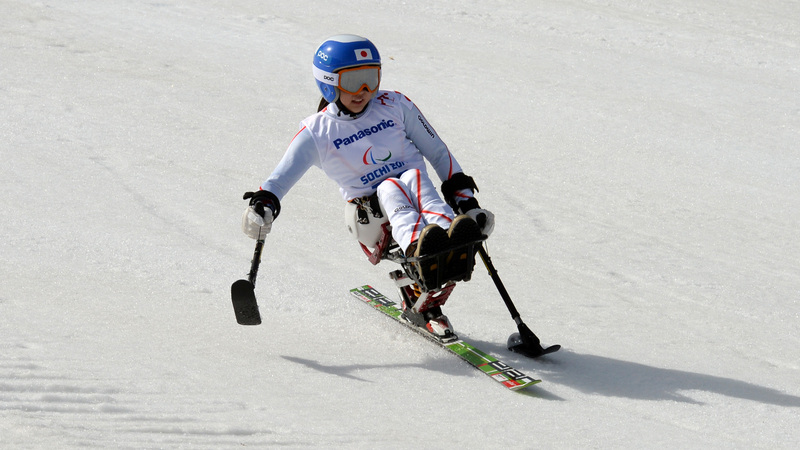 · 547 -- the total number of athletes expected -- is also a Paralympic Winter Games record. · Around 60 countries will broadcast the Paralympics, including new broadcasters NHK Japan, Rede Globo Brazil, and NBC USA. We stopped by practice today to see Team USA get ready for the Games. They went flat out for the whole time, racing around in speed laps, doing shooting exercises at both ends of the rink with Jen Lee and Steve Cash both in goal, working 40-second 5-on-5 drills from faceoffs, stopping only to swig water and listen to Coach Jeff Sauer. ICE WARRIORS’ photographer was there -- and included in these exclusive pictures are first views of Steve and Jen’s newly-painted goalie helmets. 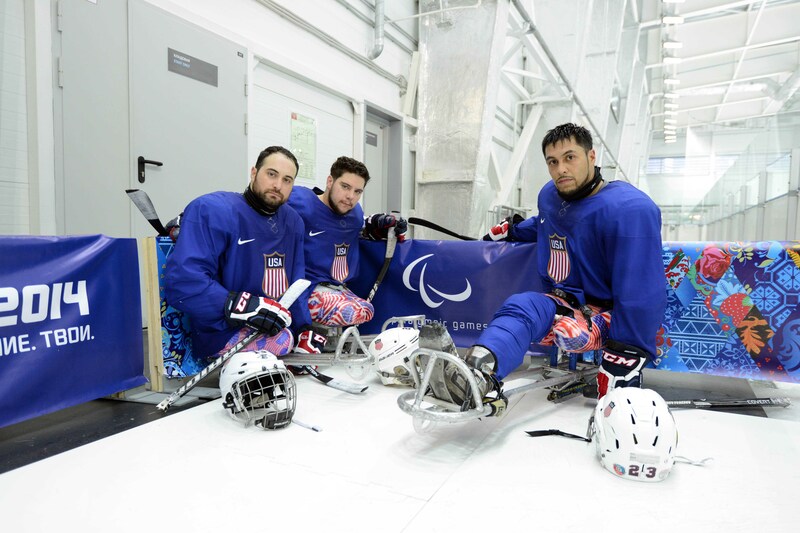 It’s a tradition that Paralympic and Olympic goalies re-paint their helmets as they want for the Games. 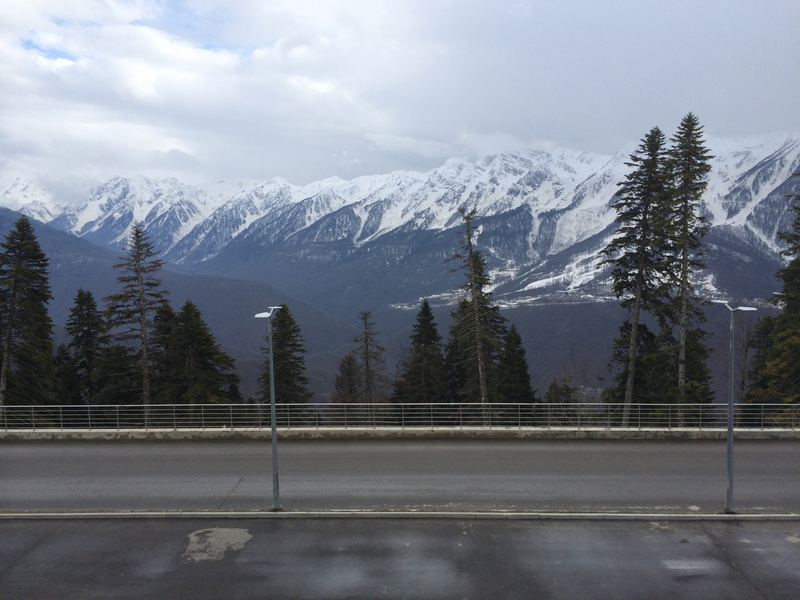 As we came down the mountains, we stopped for a moment in Rosa Khutor, a village squeezed into a narrow valley at the base of the mountains. Music was blaring and we walked into an outdoor party – a stage with folk singers and dancers, people enjoying themselves on a warm evening – at least 60 degrees F! Here are a few pictures. 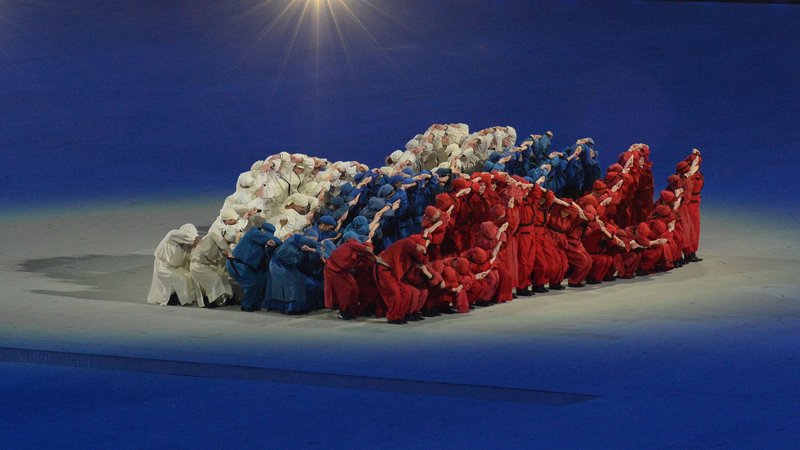 Here in Russia, the Games are a world in themselves, set off and apart. Or maybe two worlds, to be more accurate: the “coastal cluster,” where the Fisht Olympic Stadium is and where sled hockey and wheelchair curling will be played, and the “mountain cluster,” where nordic skiing, alpine skiing, and biathlon will be held. 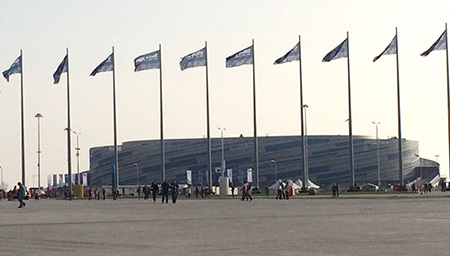 The ICE WARRIORS team is in Sochi, where the Olympic Park is very quiet, waiting for teams and fans to arrive. 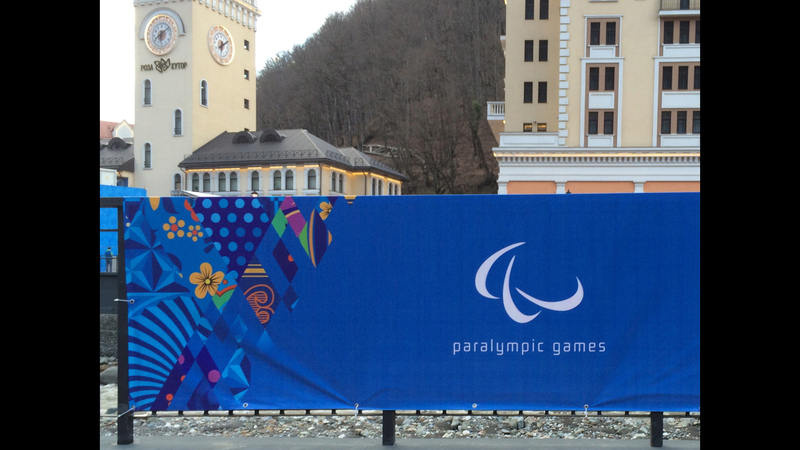 The "HOT COLD YOURS" signs are still up to welcome the athletes, but the Paralympic "swooshes" have replaced the Olympic rings on the buildings. 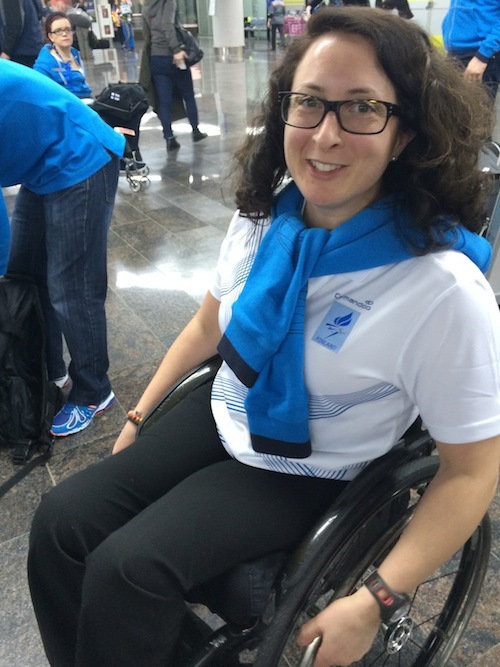 And our flight from Moscow included a group from Finland's wheelchair curling team, very friendly. Mina Mojtahedi of the Finland curling team. 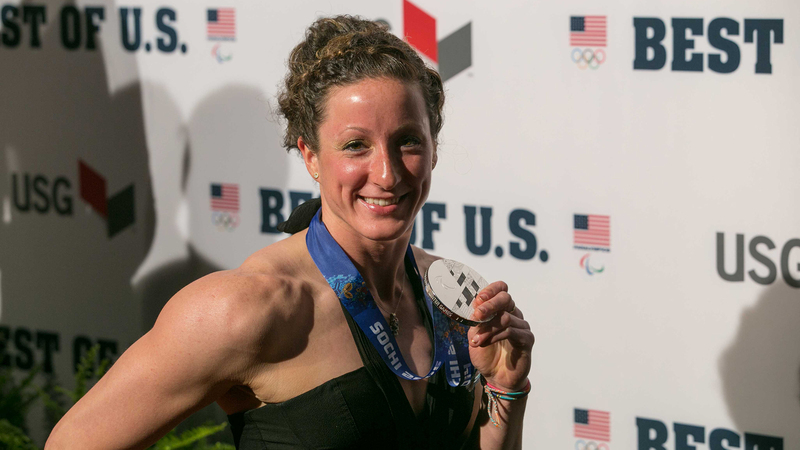 For Tatyana McFadden, London 2012 is her third Paralympics, a chance to add even more medals. For her sister Hannah, 16 years old, it’s a first-time experience. Both are competing in the 100m sprint. 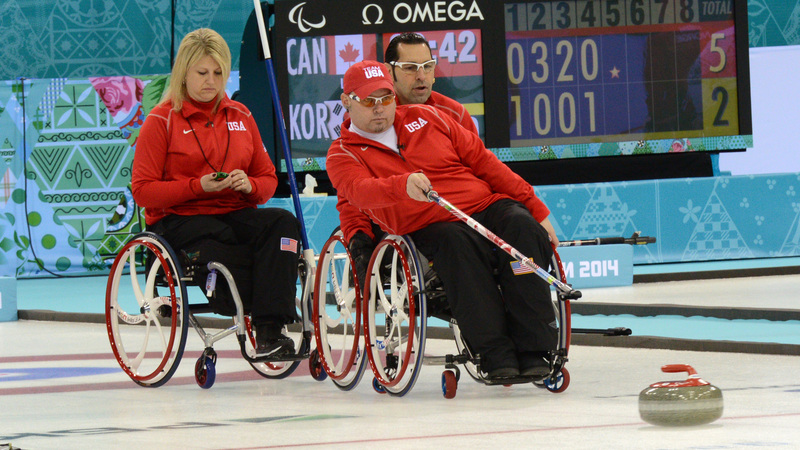 Archers Jeff Fabry and Matt Stutzman knew, going in to the Games, that the competition would be fierce in each of their divisions. Team USA’s wheelchair basketball players Paul Schulte and Joseph Chambers talk MEDAL QUEST through their bronze medal match against Great Britain’s “really good” players. 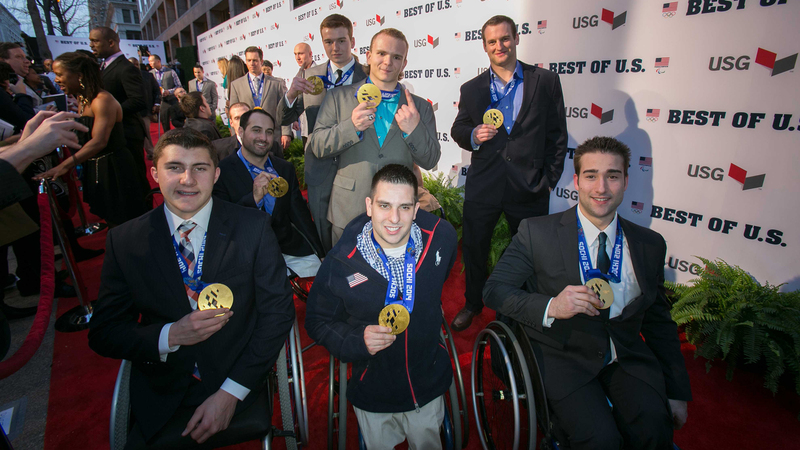 Andy Cohn and Nicholas Springer of USA Wheelchair Rugby talked to MEDAL QUEST after the US beat Team Great Britain. 8 September 2012 - Today was the last full day of competition, and the MEDAL QUEST team and I were drawn to Track and Field again. We were especially watching the preliminary heats for the women’s 100m (T-54) wheelchair race to see the McFadden sisters, Tatyana and Hannah, sprinting head to head. 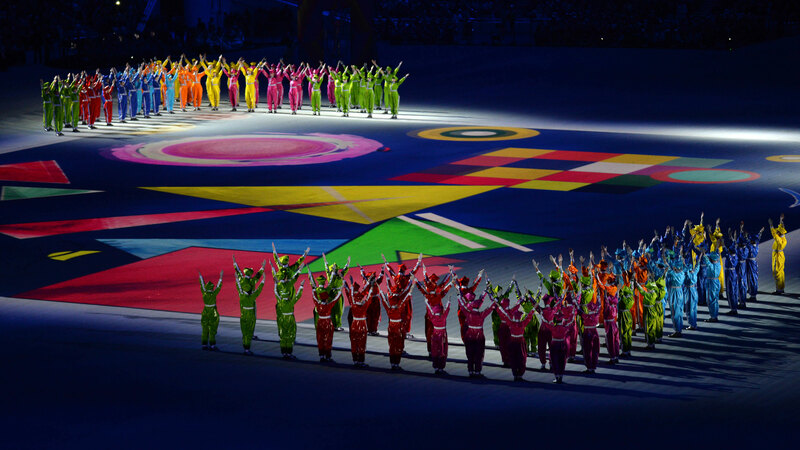 7 September 2012 - It’s coming down to the final stretch here in the Games – just one more full day of competition on Saturday, then final events and the Closing Ceremonies on Sunday. Cyclist Allison Jones knew she wanted to get to the London Paralympics, even if she had to buy her own ticket and come as a spectator. 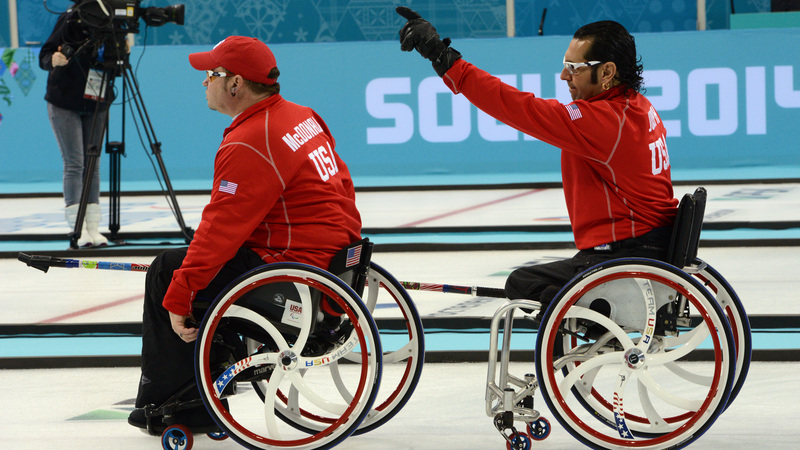 Rudy Garcia-Tolson decided last year to try to qualify in two Paralympic sports, on the track and in swimming. 5 September 2012 - Wednesday, a week into the Games, and today I was at the most packed arena I’ve seen outside of the Olympic Stadium, and the loudest, for sure. 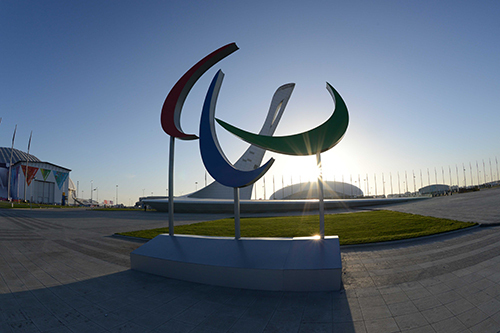 On September 1, the Paralympic judo athletes worked their way from starting rounds to final medals. 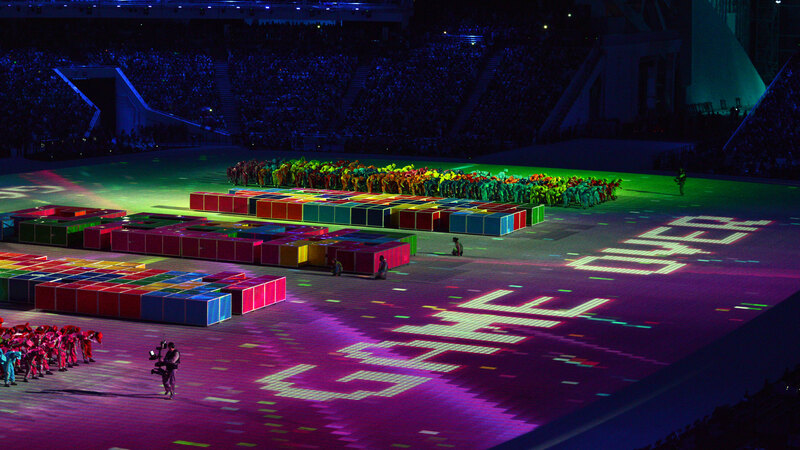 3 September 2012 - Yesterday’s play ended so late at the Olympic Stadium, I didn’t have the energy to write. But there was a dramatic race that took place that evening, made even more dramatic after the competition, so I thought I’d recap. 2 September 2012 - London’s normal rains came back today, slowing down the outdoor events. 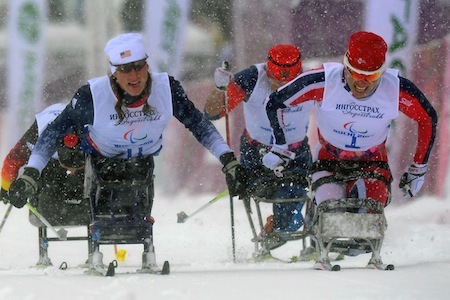 Paralympic athletes compete in the rain, of course, just as able-bodied athletes do. 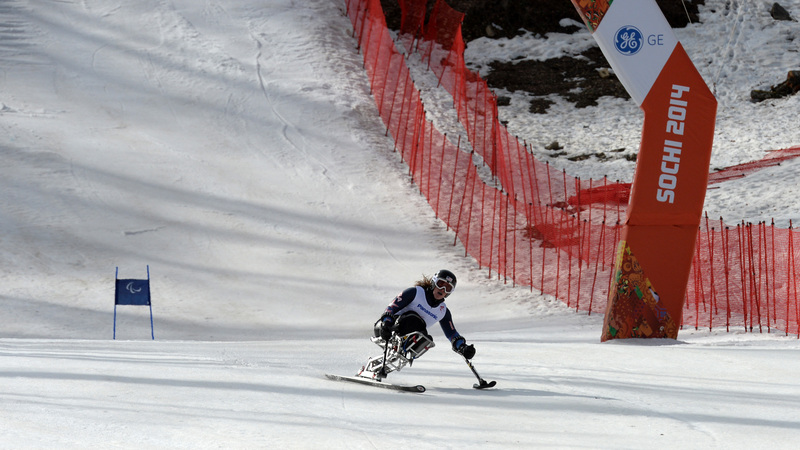 But sometimes conditions get slick or dangerous, and the very strict Paralympic competition timetables slip. 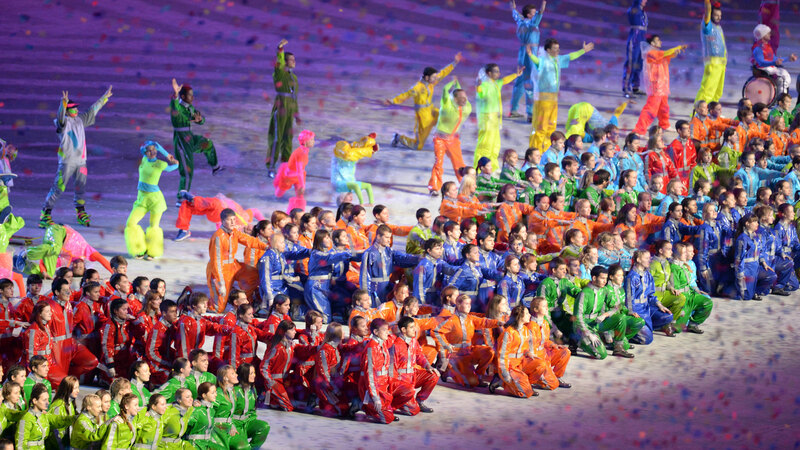 1 September, 2012 - It’s hard to explain how much goes on so quickly at the Games. In some venues, like swimming, there’s only one pool, of course, so the races take place one after the other, with just very short breaks in between them. 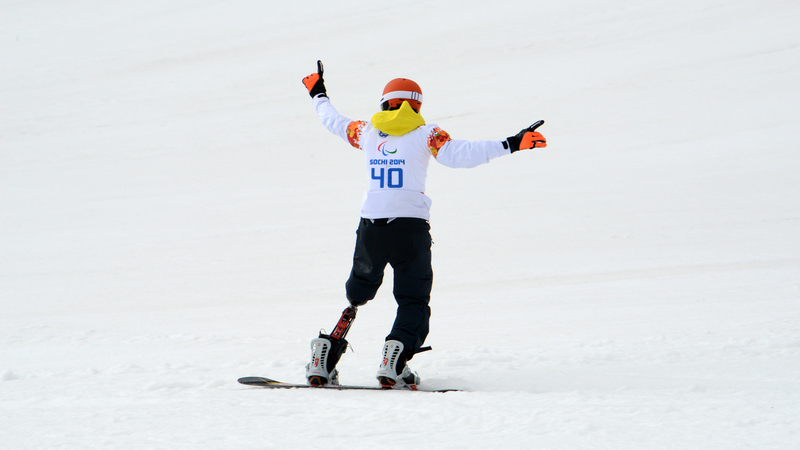 As the London Games begin, MEDAL QUEST’s Paralympic athletes share their last-minute hopes and fears. 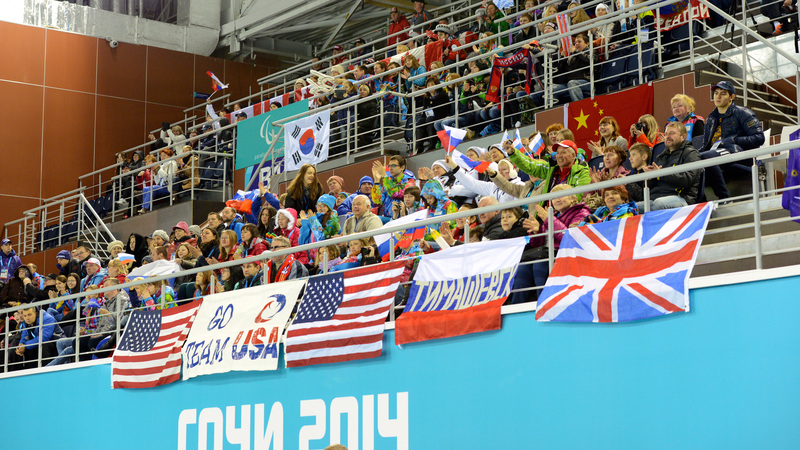 Less than a half hour to the Opening Ceremonies! Last night, the Paralympic torch was created from four flames ignited on the highest peaks of England, Scotland,Wales and Northern Ireland. Joined together in Stoke Mandeville, where the Games originated in 1948, over the last twenty-four hours, 116 teams of 5 people have run, rolled, and carried the flame the 92 miles to and through London. Judo Fighting: "Leaving It All On The Mat"
Dartanyon Crockett was a star wrestler, just "a kid from Cleveland," when the U.S. Paralympics Judo team came calling. In the Beijing Paralympics in 2008, the women’s 100m butterfly was a battle between U.S. swimmers Jessica Long and Amanda Everlove. 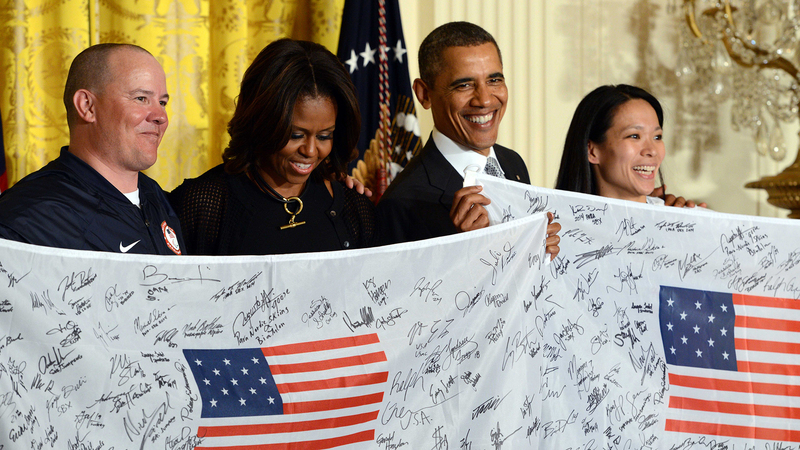 Swimmer Jessica Long won 3 gold medals at the Athens Paralympics at age 12. Then she won 4 gold medals, a silver and a bronze in Beijing at age 16, setting 3 new world records – and she still felt she’d failed. The 2008 gold medal match in women’s sitting volleyball was a hard-fought contest between the home country, China, and Team USA. "I always wanted to be an athlete." Growing up in a small town, according to runner Sabra Hawkes, she didn’t know people had cerebral palsy. A Preview of London’s Top Swimming Races? In the 2011 IPC European Championships, the women swimmers competing in the 200m medley (SM6) included world record holders and top medal contenders for London. Ileana Rodriguez was a dancer in Cuba before a spinal cord injury. "All of us have challenges in our life," she says. 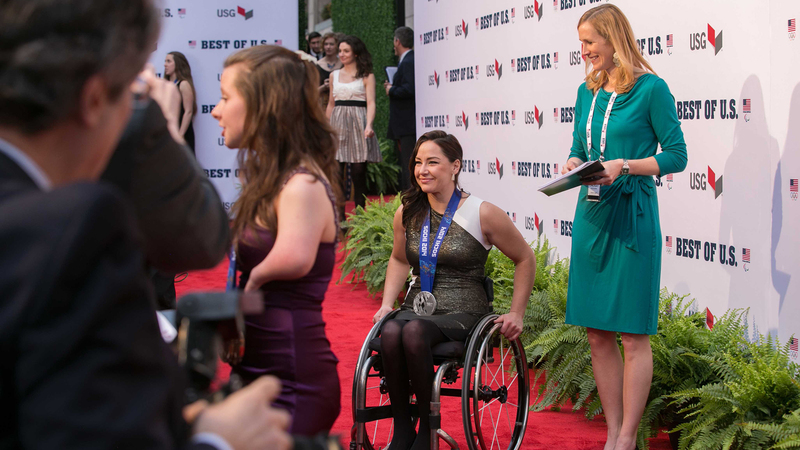 At the 2011 World Championships, the women’s 400m wheelchair racing finals saw a field of three Americans, three Chinese, and two Australians. "You’re trying to hit that perfect mark." Equestrian Wendy Fryke describes her sport as a combination of floor gymnastics and ballet – on a horse. In Beijing 2008, swimmer Rudy Garcia-Tolson set a world record in the morning heats that qualified him for the finals in the 200m men's individual medley. 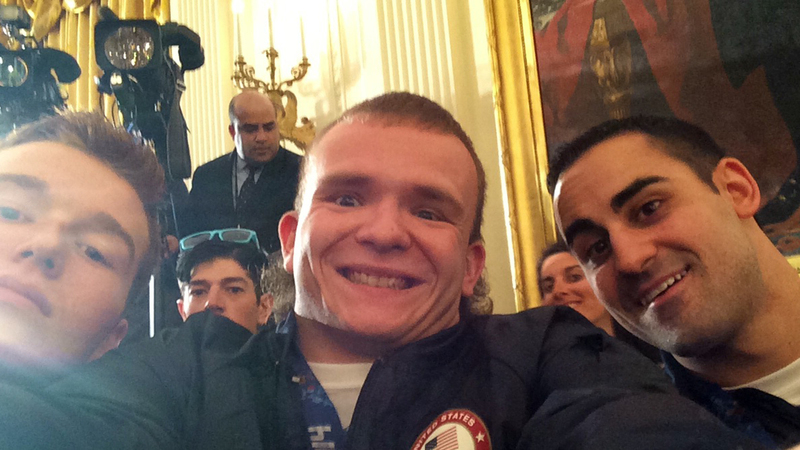 Swimmer Rudy Garcia-Tolson looks at the Paralympics as a once-in-a-lifetime opportunity. 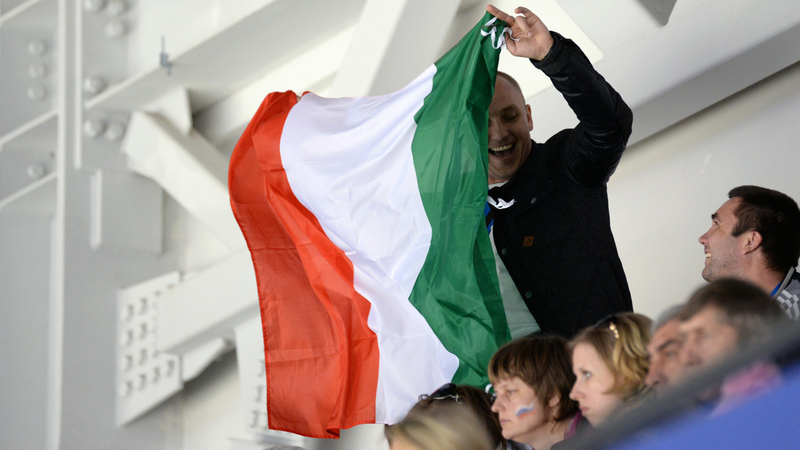 "I can represent my country again." 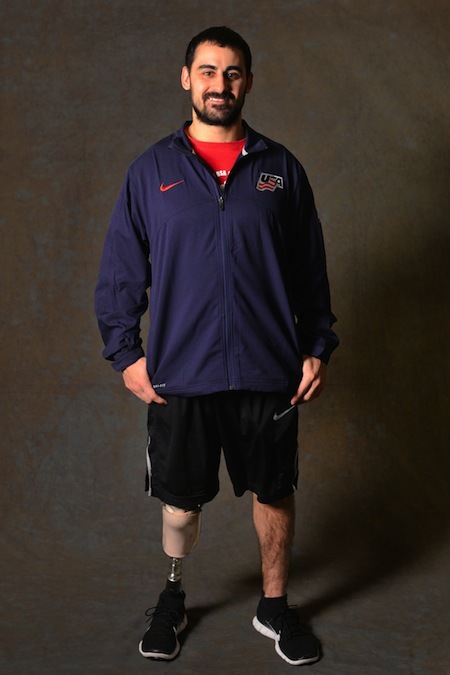 Paralympic archer Russell Wolfe says he "searched for years to find my way" after an accident ended his military career. 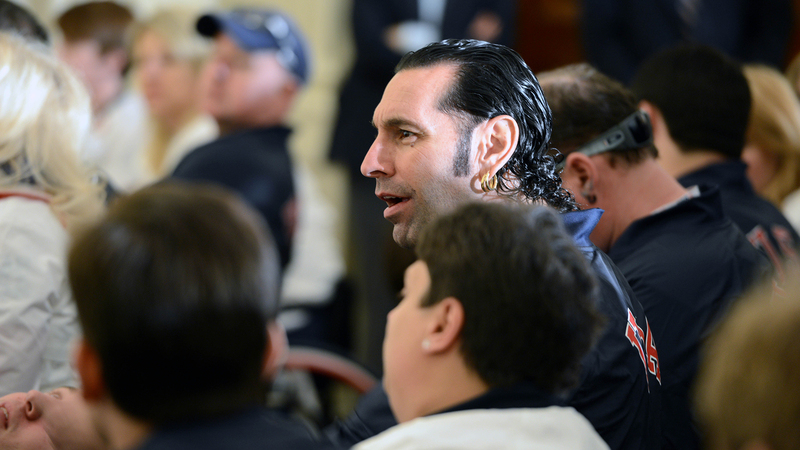 In London, for the first time, Paralympic Tennis will have its own special tennis stadium. 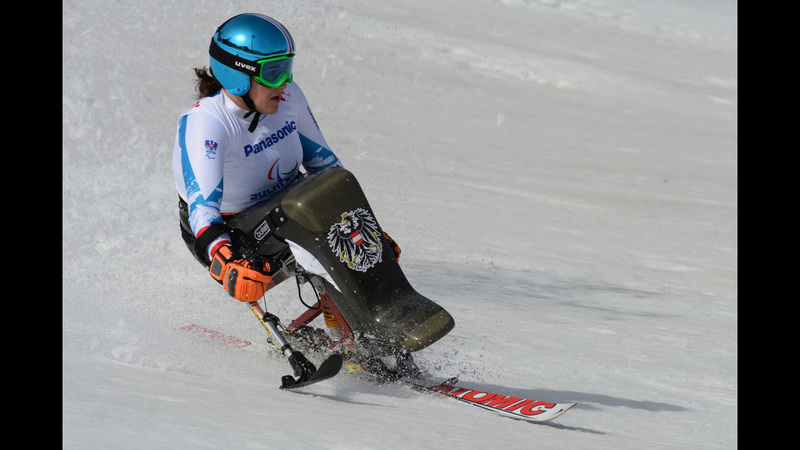 Prosthetist Shane Ryley reveals the special care and technology needed to create high-performance artificial limbs for athletes - and to keep them tuned perfectly for best results. 21 YEARS LATER, I’M STILL TRYING IT OUT." Canadian player Dustin Hodgson says he didn’t want to play "football" – as he calls soccer -- but his mother signed him up and he loved it. 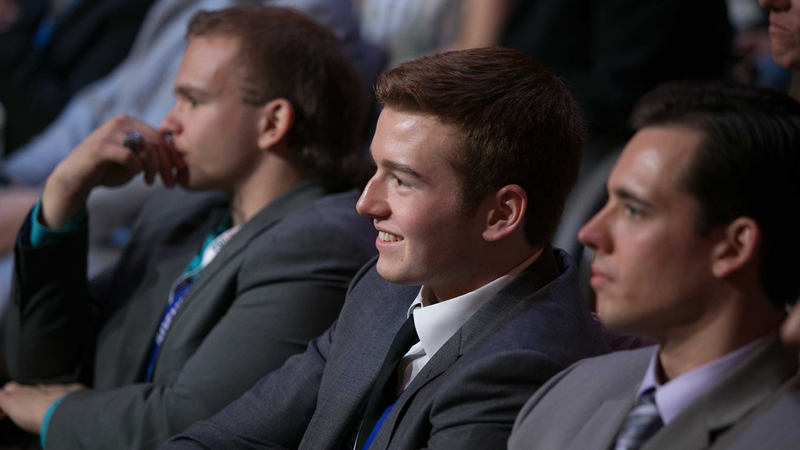 Chris Ahrens explains that he and his teammates committed to London 4 years ago – and it took some tough playing to get them there. 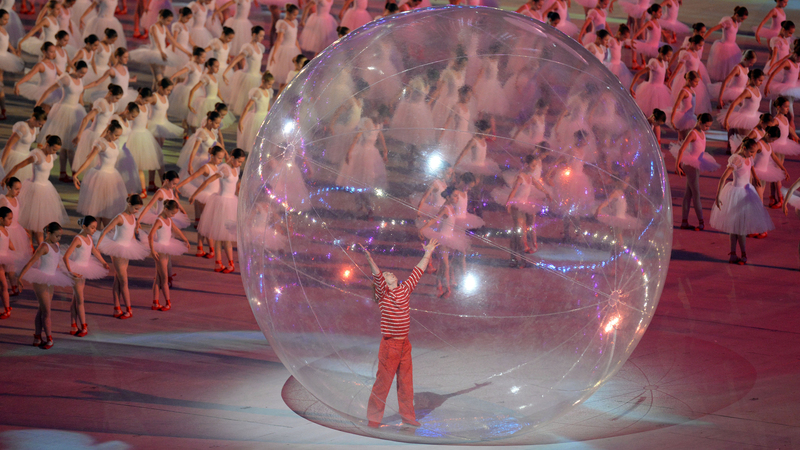 In shot put, as in many other sports at the 2008 Beijing Paralympics, another world record was set. 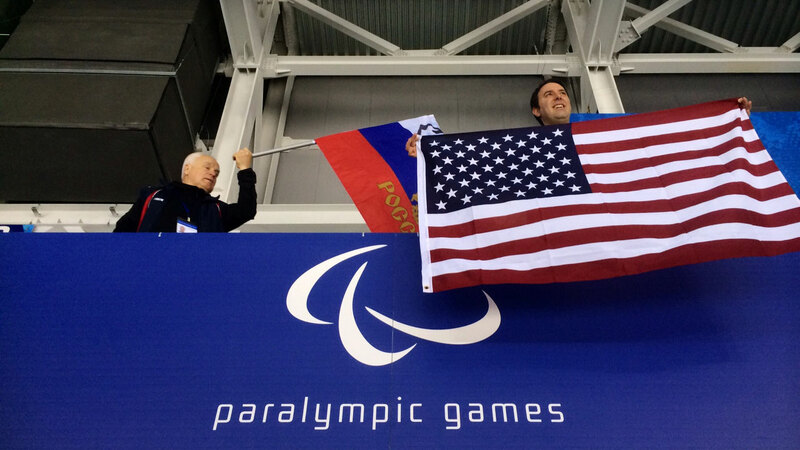 Jeff Fabry, bronze medalist in archery in 2004 and 2008, is looking to “make a statement” in London 2012. 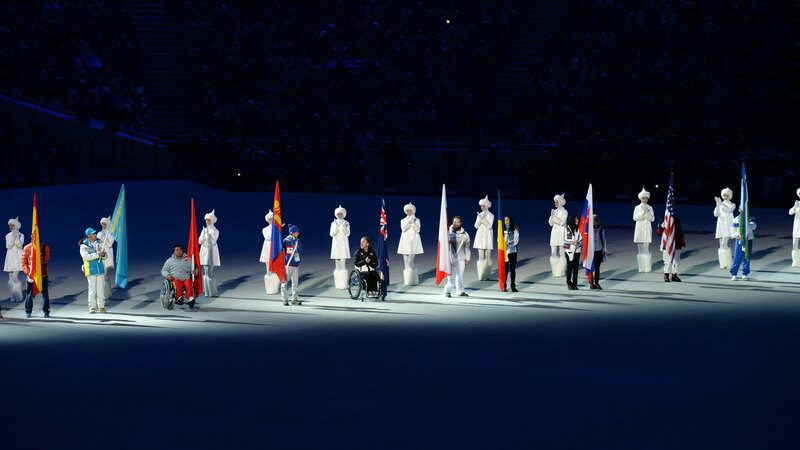 MEDAL QUEST kicks off with an introduction to “the best athletes in the world” – the elite athletes of the Paralympic Games. 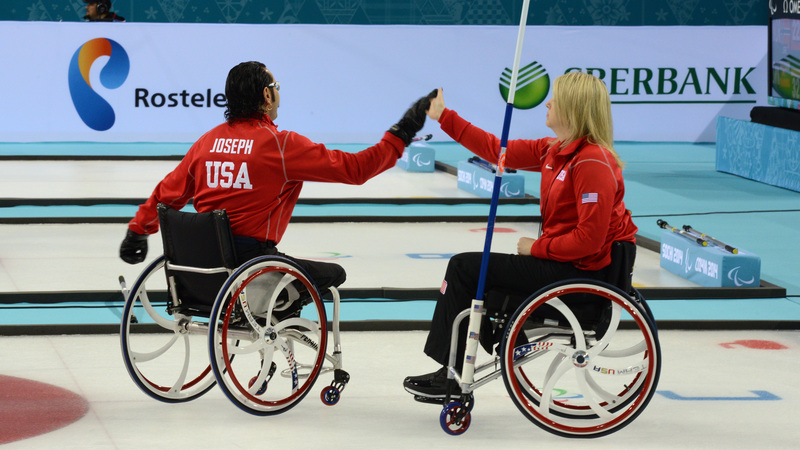 Competing in sports as different as wheelchair basketball, archery, judo, cycling, and more, these American athletes personify the grit, the strategy, and the skill it takes to go for the gold. In the 2008 Beijing Games, competing in the category of women under 40 kg, Lidiya Solovyova of Ukraine lifted more than 2.5 times her own weight. 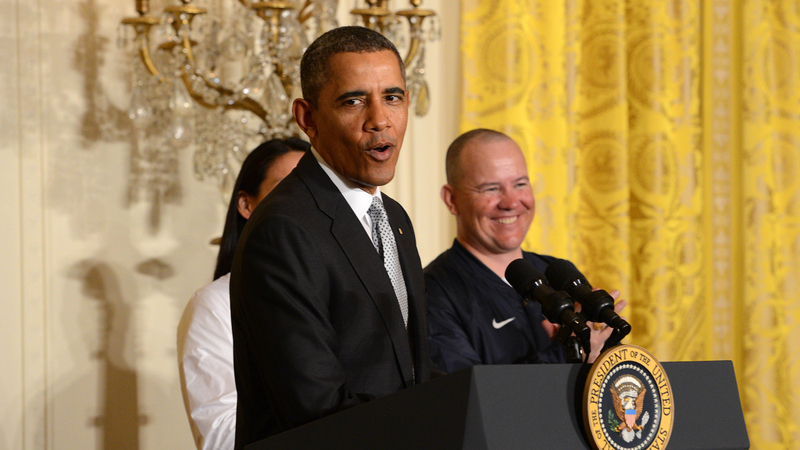 "If you’re not thinking two steps ahead of your opponents," says Eric Duda of men’s sitting volleyball, "you’re already behind." 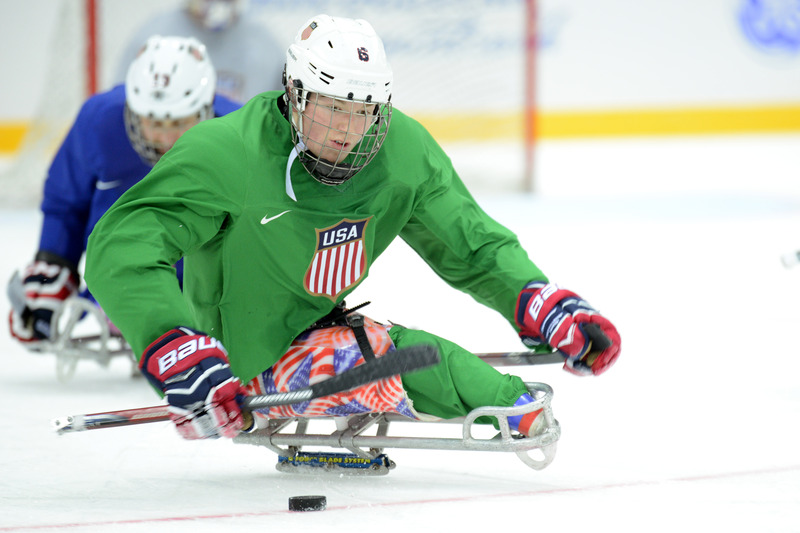 “You would think that person was born with the chair attached to them” – that’s how one athlete describes the perfect fit for a sports wheelchair. 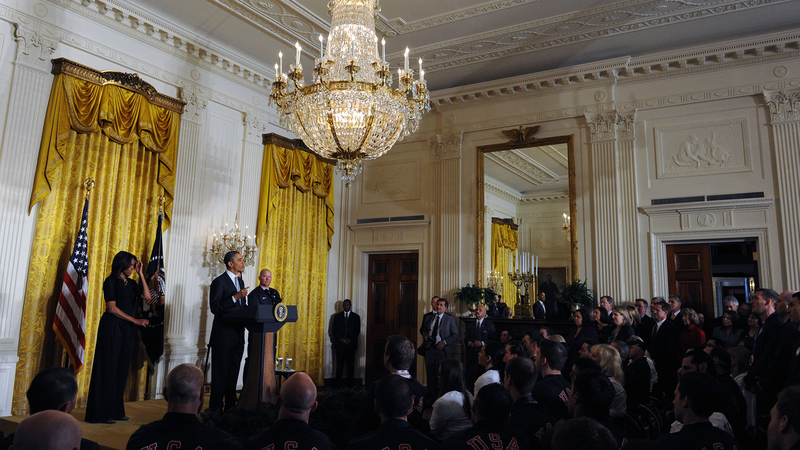 The Warrior Games – a chance for injured service men and women to show their abilities and bring glory, again, to the Army, Navy, Marines, and Air Force. The 2011 men’s final in the 800 m (T-11) pitted two brothers from Canada against athletes from Colombia and Brazil in a race that came down to the last 20 meters. 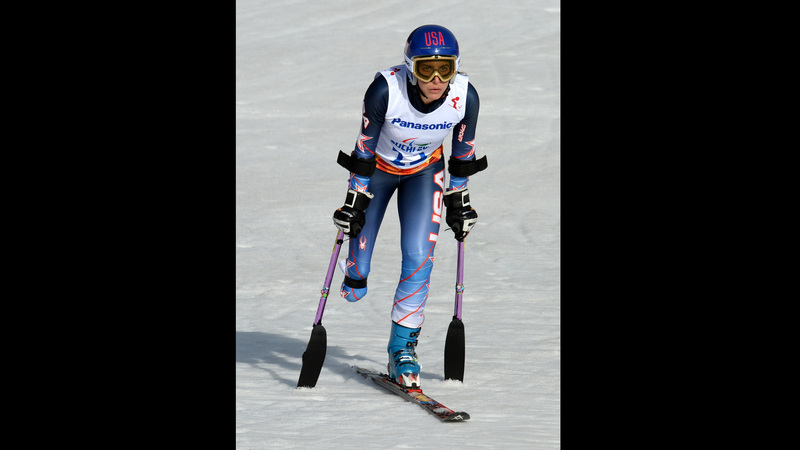 Bonnie St. John looks back at her Paralympic experience and is "overwhelmed with joy and awe" at the competition today. To some, goalball looks like a cross between bowling and soccer. The players know it as a tough, physical sport with lots of strategy and speed. One of the most anticipated races at the 2011 World Championships in New Zealand was the men’s 400m race for T36 athletes with cerebral palsy. 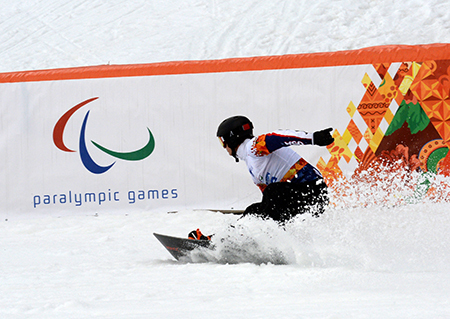 It takes years of training to be a Paralympian, with long hours and a true competitive drive. “We have no slouches,” says judo’s Myles Porter. MEDAL QUEST featured athlete Katy Sullivan races against world record holder Michelle Errichiello of Australia and other top runners at the 2011 World Championships in New Zealand. In 2008, world records were shattered over and over again in swimming. At the IPC Athletics World Championships, so many teams were disqualified that the final race for the women’s wheelchair relay (T53/54) was down to two teams: China and the U.S.
Blake Leeper talks about the intense level of competition in Paralympic sports and how he stacks up against two of the biggest names in racing: South Africa’s Oscar Pistorius, and America’s Jerome Singleton. Anchored by Jerome Singleton, the U.S. sprinters needed a clean start and fast laps against a strong international field at the Beijing Games in 2008. Cyclist Allison Jones gets a sneak peak at the brand new Velodrome in London, where she’ll be competing this summer. 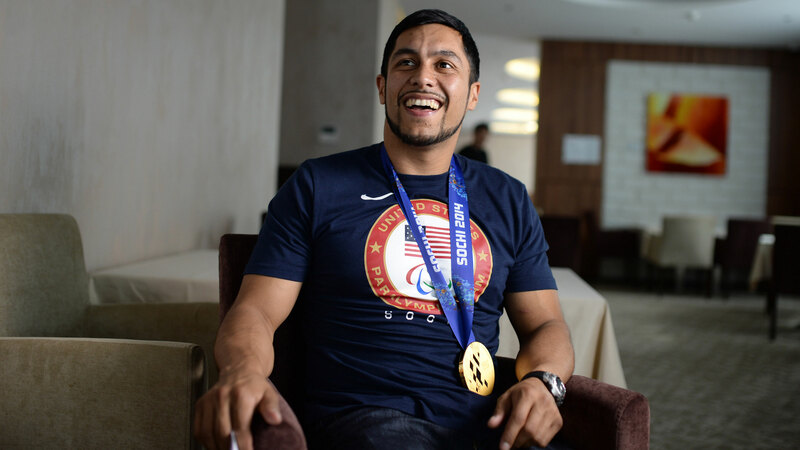 "THESE LAST YEARS HAVE BEEN A WHIRLWIND"
Judo fighter Myles Porter talks about his rival and nemesis -- and off-court friend – Brazil’s Antonio Tenorio da Silva, and about what drives him to compete. 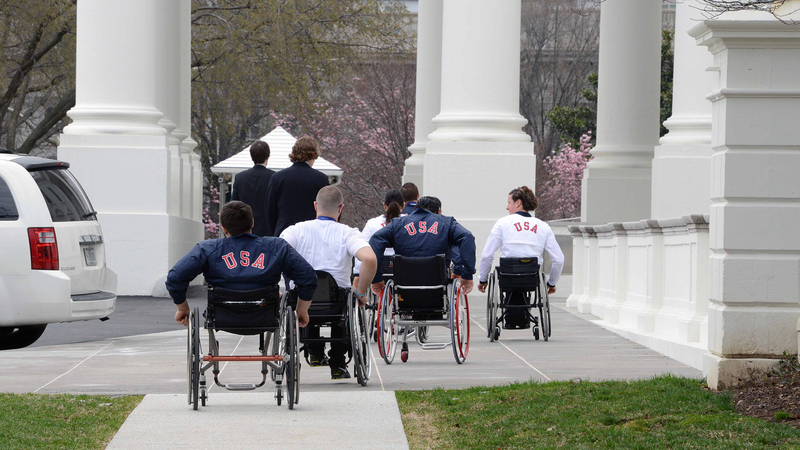 American judo fighters, including MEDAL QUEST’s featured athlete Myles Porter , show how they prepare for an important qualifying event, the 2011 Parapan American Games in Mexico. Paralympic sprinter, long jump competitor and U.S. Army veteran Kortney Clemons talks about the IED that took his right leg and killed three of his friends in Iraq. Lightning-fast speed is the hallmark of a successful fencer. 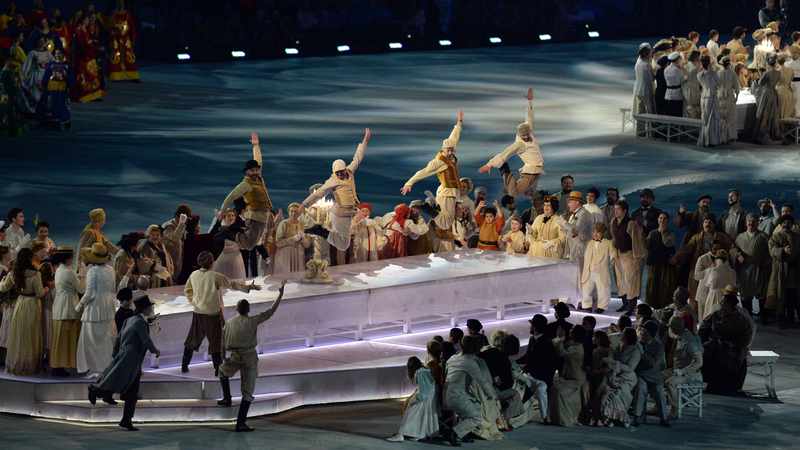 As this 2008 gold medal match shows, fencing requires enormous concentration, and points are won in just seconds.